Dear Dr. Bauer and Ms. Webb-Hammond: Stan and I wish to thank you for your ongoing communication with us regarding his almost bimonthly MRI’s. We are grateful for your concise messages reporting on his improved condition. It is always reassuring to hear your evaluation. Our family was most grateful for your kindness during his surgery and thereafter and now for your continued involvement in his health. Dr. Nanney and Dr. Bauer performed surgery on me to remove a large vestibular schwannoma. While the initial diagnosis and potential impact on my life was overwhelming at times, they took the time necessary to explain the surgical alternatives and the associated risks. The care provided by them and their surgical team was exceptional. The surgery took longer than expected due to the precision that was required to preserve my facial nerve. The surgical team kept my family updated along the way and the surgeons took their time to ensure my quality of life post-surgery. This type of care continued during my follow-up visits with Dr. Nanney and Brian Bixler. It has now been over a year since my surgery and my life is back to normal, with the exception of some expected hearing loss. Thank you for everything! Dr. Nanney restored me to a normal life. We first met in ER where he was called to consult on my condition. My spine above a previous fusion had deteriorated such that I was in severe pain and was losing control of my legs and other bodily functions. The surgeon who did the previous surgeon had told me no more surgery could be done because I would likely “die on the table”, and that pain management was my only option. Dr. Nanney reviewed my scans and concluded that further surgery was complex and risky but could be managed and that without surgery the resulting nerve damage would likely leave me with paralysis in addition to the incredible pain. He performed another spinal fusion the next morning. He and his team brought me through the surgery safely, and his expertise gave me the chance to regain the ability to walk and allowed restoration of bodily function control. I told him he was a miracle worker, and for me, he clearly demonstrated it. Dr. Nanney, I wanted to take a moment to share where I am now compared to a year ago and to thank you. At the end of 2017, and the beginning of 2018, I could not walk. I couldn’t even take my daily walks with dog Jake. Because of your work not only do I have my life back, I relish every step and so does Jake! Thank you! Dr. Nanney & Surgery Team: I wish to express my gratitude to Dr. Nanney and the team of people that were needed to help with my laminectomy. This most recent surgery that involved you appears to be most successful, I feel very blessed. Thank you. My partner was brought by ambulance into the ER of Foothills Hospital after suffering a seizure soon after we arrived in Boulder from North Carolina. I am writing to thank you, from the bottom of my heart for the excellent and devoted care and attention that she was given. Dr. Rajpal gave us a clear and frank interpretation of the MRI Images. He presented us with directive as to what actions they proposed with a series of options along with the advantages and disadvantages of each option. I am grateful for the staff of the emergency room and Dr. Rajpal. I first met Dr. Nanny a few months ago when one of my discs ruptured and I ended up in Good Samaritan in Lafayette. This would be the second surgery I’d have on the same disc which made it more difficult. The first surgery I had as Mass General in Boston three years ago. Dr. Nanney is by far one of the best surgeons or doctors I’ve ever met. I moved from Boston two years ago so that’s saying something. Not only did he do an amazing job he took the time to explain everything to me and my family. He has an incredible bedside manner and a great sense of humor. I was in the hospital for nine days and spent three in the ICU. Dr. Nanney and his team visited me constantly and I never felt alone or out of the loop. After I left the hospital, his practice has been equally amazing. Chelsea at the office rocks and his assistant Brian is awesome. Throughout all the complications and regular appointments his team never missed an opportunity to make me feel like a person and not just another patient. To anyone who needs back surgery and wants to be treated like a person, I can’t recommend Dr. Nanney and his team enough. To put it mildly, they’re awesome!!! I believed I had simply “pulled my back out” one day. I have pulled my back out several times in the past and I thought nothing of obtaining chiropractic care for my back injury. After five months of a lot of pain and numbness and worsening symptoms, my family physician had me obtain an MRI. It’s then that we discovered that I had a severe lumbar stenosis of L3 & L4 and my family physician referred me to Boulder Neurosurgical & Spine Associates for the first available appointment. I have to omit that I was a bit concerned about what physician I would end up with on a “first available” appointment. I would like to mention that I was offered an appointment right away and due to my work schedule I postponed the doctor’s appointment by one week. My appointment was set with Dr. Nanney for the following week. In that one week of postponement, my spinal column was being compressed to a point where I was beginning to lose feeling in my groin area. When I met with Dr. Nanney and he saw in my signs and symptoms that I was having an issue with losing feeling in my groin area he explained to me that I had something call Cauda Equina and it is considered a surgical emergency before the nerve damage becomes permanent and I could possibly be incontinent for the rest of my life. Dr. Nanney wasted no time and had me scheduled for surgery the very next day. I’m six weeks post-surgery and I’ll have you know I went dancing with my family last weekend! Dr. Nanney is an extremely competent Neurosurgeon, he is kind, he is humble, and he goes beyond the call of duty. He even offered to assist us with our insurance company if need be. Because of Dr. Nanney and his quick response, I am relieved to say that I have no permanent damage related to my spinal compression. Words cannot express how extremely grateful I am to Dr. Nanney and his staff. He has given me my life back! Learn from my mistake and DO NOT POSTPONE YOUR APPOINTMENT. There would have been other treatment options available to me if I hadn’t waited so long. Thank you so much, Dr. Nanney!! At my age, I have been to a number of physicians. Dr. Nanney is a rare find. You will not be disappointed with him. Dr. Nanney: thank you for doing what needed to be done, and with the speed, it needed to be done. Because of you, it appears I have no permanent damage. I owe you a world of gratitude. I feel so fortunate that I had such a gifted surgeon…I am grateful for you are! Dr. Beasley and Christie: it has been a year and a half since my neck surgery in 2017. I just wanted you to know that I’m still feeling 100% and have been riding horses again with no problems. I am so pleased with the results of my surgery. I was able to finish my doctorate and spent the summer working at the scout camp doing maintenance and construction with no problem. My range of motion is still 100%. I would highly recommend you to anyone else considering surgery. Dear Dr. V: I’ve been thinking about you and your team a lot over the past few months, and about how much I owe you. Although I wasn’t planning on racing, I entered one that’s held near here. The race was lots of fun, and I was told afterward that one spectator commented on my running form. The person she was talking to was an old friend of mine, and he told her that there was a time when I not only couldn’t run, I couldn’t walk down a hallway…. the person who commented first just couldn’t believe it. I took the third IMH slot for my AG as a result. It’ll be fun to be back in Kona for the first time in a while, but as I was driving home from Quebec, I was thinking about what it meant to be able to jump into a race because there would be a fun group there, and how it felt for my legs – not my back – to be the limiting factor on a hard day out. I was thinking about being in the overall top 20 or so at the last turn, and how it felt to be in the mix instead of off to the side. And of course, it reminded me that without you and your team, none of those moments would have been possible. I’m sure I sound like a broken record at this point, but I simply can’t thank you enough for giving me back my life. The feeling of being able to do hard things with my closest friends is irreplaceable, and if it hadn’t been for the fantastic job you did with respect to my micro-discectomy, those experiences would have been lost to me. But beyond that, there isn’t a day that goes by without some thought of what you did for me: being able to sleep through the night, and put shoes on unaided, were things that I wasn’t sure I’d ever do again. The other things are magical too, but just being able to get through my day to day life without pain would be reason enough to thank you every morning. So: thank you, again. Thank you for making the stuff that everyone takes for granted possible for me as well, and thank you for making the things I love an everyday event. Words really can’t convey how grateful I am, but I hope that some small fraction of my gratitude is apparent. Thank you for all you did to make my journey through treatments and eventual surgery successful. You all made it so manageable from referrals to scheduling to insurance processing. All of my questions were always heard & answered to my satisfaction. You all have my thanks & gratitude. Dr. Rajpal & Vickie – thank you so much for saving me from a horrendous spine surgery which, it turns out, I did not need. After one spine injection, PT, exercise and time, I am now pain-free, mobile and mostly back to normal. With Your help, I feel like I really dodged a bullet! Thanks again for advising me to wait and try non-surgical alternatives. I would like to extend my most sincere gratitude and appreciation for the excellent care I received from Dr. Kara Beasley and all of those associated with the Boulder Neurosurgical & Spine Associates. The preparation before surgery from the team was both informative and comprehensive, with even the dumbest questions from my wife and me addressed with the kindest patience. When communications with Kaiser broke down, your staff was fast available to come to the rescue. The professionalism and personalization were obvious at every phase of surgical and post-op follow-through, and I always felt I was in the hand of good, caring friends. My deepest thanks for making this experience a smooth transition to my new body, free now from the debilitating pain of spinal stenosis. Dr. Rajpal did both my craniotomies so far. I was so blown away by what he accomplished with the first surgery – an emergency craniotomy with a new patient with 2-3 hour notice, leaving me at the end of it with one complete brain tumor less, and with zero side effects when thousands of things could have gone wrong – that I was looking up to him as ‘God’ right away. He confirmed the MRI shows the surgery was successful & I don’t need a second one immediately. A million thanks to this skillful surgeon’s abilities and talent! I wanted to let everyone know that I received the best care at BNA. I felt very comfortable from the very beginning with the office and the staff. Dr. Bauer told me like it is, he did not sugar coat anything. I knew from day one that I was in good hands. That is sometimes hard to know from the first visit. I had to have a cyst removed from my brain and I could not have asked for a better surgeon or better care. They all made me feel at ease and from the first visit on, I was not worried about the outcome. I am now cyst free thanks to the beautiful and professional care that I received. I will recommend this team to anyone and everyone. Thank you so much for all that you have done for me. I appreciate Dr. Nanney and his office’s expertise and caring. I had spine surgery in November 2017. The surgery and my recovery went well. Thank you very much. I highly recommend Dr. Nanney and his team. Dr. Nanny did my spinal neck surgery on April 3rd, 2018. I received the most effective, efficient and personalized care during my treatment. I respect him from my buttom of heart for his professionalism, excellent capability, and experience. Dr. Rajpal treated my mother so well. She had some struggles remembering some of her situation and I am sure Dr. Rajpal wondered what the big deal was. But it was a blessing to have him actually examine her and find that she was not having pain as he tested her strength in many areas as well as actually looked at her back and addressed some concerns we had. Some she is just getting older and she is quite thin. He finished by addressing her and told her she was doing very well in her healing and to go on and enjoy the things in her life that she enjoyed – but remember what had caused her back pain – some lifting of heavy things and maybe a fall. He reminded her that she has osteoporosis so the chances of injury are high unless she is mindful of her condition. He looked at me and told me to continue to take care of her and help her remember that she needs to take it easy in doing things that could cause her to fall and not to lift heavy things but to help her enjoy life. Beginning in 2012 and progressing with each subsequent year, I experienced increasing pain in my lower back and left leg. By August of 2017, it progressed to a severe intractable pain that prevented me from standing or walking for more than a few minutes without a crippling episode. Even fixing breakfast was agony, and the quality of my life was approaching negative numbers. Despite the severity of my condition, my HMO had such a great backlog in Neurosurgery that two appointments for treatment spanned the entire summer while I waited for openings, and I was stranded many weeks away from seeing a surgeon to discuss my options. During a visit to the ER in late August, I fortuitously met Dr. Tripp Nanney who had just completed a surgery. He felt he could help me and suggested I make an appointment with BNA. With referral in hand, two weeks later I was in his office discussing options for surgery. My issues were both degenerative disc disease and multiple stenoses causing nerve impingement at many sites in the lumbar spine. I also had significant scoliosis. 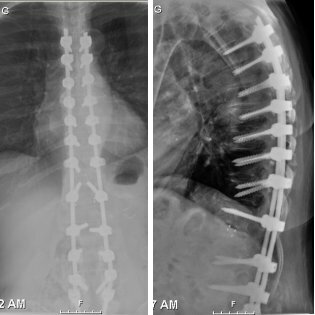 A lumbar fusion of L2 – L5 was indicated, and surgery was scheduled for October. It went flawlessly. While it was apparently all in a day’s work for Dr. Nanney, I won’t minimize the importance of post-operative care, pain management, good nutrition, home health care and in particular, a careful practice of physical therapy. That is to say, I didn’t jump out of bed the next day and launch into my next home improvement project, but all of the preceding led to steady healing in my back and the regaining of physical mobility and function. It’s difficult to express how wonderful it is to once again be able to take long walks, to hike, to ride a bike, and as spring came on, to work in the garden. These are all things that had dropped out of my life and are now – as if by magic – restored. But I don’t confuse magic with skill and knowledge, and Dr. Nanney’s mind and hands are abundantly blessed with both. It’s no secret that Boulder Neurosurgical and Spine Associates enjoys the highest reputation for the quality and capabilities of its surgical staff. As I understand it, having been with them for only two or three years, Nanney is the new guy on the block with BNA. They don’t invite just anyone to join the practice, and that in itself is high praise. If anything more needed to be said on the subject, his talent, training, and credentials are impeccable. I’d be remiss if I didn’t mention Dr. Nanney’s capable physician assistant, Brian Bixler. It seems really good practice to have a designated PA to work with the surgeon as a team: someone who’s very familiar with a particular surgeon’s technique, pacing, etc. Brian also showed himself to be knowledgeable in his own right, as well as displaying considerable patience in answering my questions about the technical aspects of the surgery. In closing, I want to express my appreciation for the fruits of Dr. Nanney’s labor. This excellent surgery has restored a sense of happiness and well-being to my life that I thought I’d never recover. I am deeply grateful, and I give him my strongest recommendation. Dr. Nanny did my neck surgery on April 3rd, 2018. I received the most effective, efficient and personalized care during my treatment. I respect him from my bottom of heart for his professional capability and the great experience. Thank you, Dr. Nanny. To Dr. Villavicencio, Alex, Eric and the rest of the team: I wanted to let you know how well I am doing, now about 6 months post my cervical foraminotomy. Despite a rough first few months, the arm pain, numbness, and weakness have almost completely resolved, and my original Neck pain has vastly improved. Thanks for all your hard work and expertise! I am eternally grateful to Dr. Villavicencio and his team. In October, I received an artificial disk and I I have never felt better. No more numbness, no headaches, and I am back to full strength. They considered my options and truly listened to my concerns before working with me on the right solution. I was completely incapacitated with a ruptured disc. Dr. Nanney assessed my condition, confidently said he could fix it, and did just that. I got my life back. My experience allows me to recommend Dr “Tripp” Nanney without reservation. I met with Alex, PA-C for my 6-month post-op visit for an L3-4 fusion. I write this note as a sincere voice of gratitude to the Boulder Neurosurgical & Spine Associates (BNA) and as a testimonial to the public of my experiences both of medical success and personal appreciation for the care from the staff at BNA. This is my story…I had been an enthusiastic “walker” for years and was preparing for my a 60 mile, 3-Day Breast Cancer walk in 2005. I assumed my low back discomfort was due to this event preparation. I visited my primary physician with increasing lower back pain and bilateral lower extremity numbness. An MRI was ordered; my primary physician urgently referred me to BNA. I was alarmed to learn a tumor was strangling a nerve along my spine; surgery was immediately scheduled to remove a Nerve Sheath Tumor at L4-5. The pain relief was amazing! Recovery with physical therapy was inconsequential. The BNA team were ALL pleasant, calm and professional in their care pre and post-surgery. Years went by without discomfort THEN in 2015 my aching back returned! The alignment of L3-4(forward displacement) had been affected due to the process to remove the tumor in 2005. Physical therapy and minimally invasive spine treatments were my preferred first choice though BNA had advised surgical spinal fusion to correct L3-4 spondylolisthesis. In June 2017, my increasing low back pain convinced me it was time for surgical repair. A fusion to L3-4 with hardware was performed. AGAIN the pain relief was outstanding and BNA’s care pre and post-op have been indescribably supportive and thorough. I am forever grateful for their care over the past 10+ years. Looking back I wish I had agreed to move forward with the proposed L3-4 fusion which BNA had first advised in 2015! I have been a nurse for many decades; my heartfelt and professional trust goes to the BNA Team. I wanted to specifically thank Dr. Villavicencio and his PA Eric Busch. I was diagnosed with a severely herniated disc between my C5 and C6, creating significant pain and numbness in my left arm/hand. I met with a couple of surgeons in Florida – where the injury occurred – and all recommended removing the disc and fusing my neck. As a very active 31-year-old, I was extremely worried about future complications from fusing my neck at such a young age. 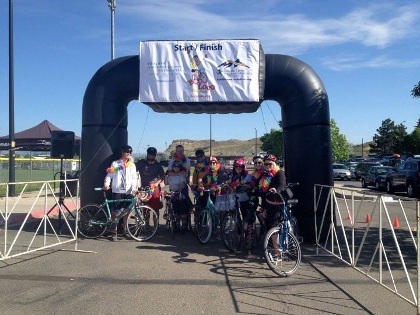 Subsequently, I made the decision to move to Colorado after learning about Dr. V and the success he’s had with partial foraminotomy surgeries, rather than disc removal/fusion. Dr. V and his amazing team were able to perform the foraminotomy back in October 2017, I immediately felt relief and regained feeling in my arm and hand upon waking from surgery. Now 3 months later, I am completely pain-free, the numbness is gone, and best of all, I still have all my discs! I cannot thank Dr. V and his team enough for literally saving my life. The level of compassion and professionalism is second-to-none, and I will forever recommend Dr. V and the rest of BNA to everyone I meet! It has now been over five years since my surgery and I am long remiss in expressing my thanks to Dr. Kara Beasley and her staff. Dr. Beasley took my case and performed the surgery to stabilize my spine after a burst fracture sustained in a biking accident. By God’s grace, about four months later I was able to go back to work in a quite physical job and subsequently to the active life I had led before. Friends and employers did not give me much of a chance to have a successful recovery but Dr. Beasley and her staff continued to be confident that I would. In Human Resources they were referring to me as the “miracle man.” For a long time, I was focused on the peripheral residual effects of the surgery not realizing that this was the new “normal.” Gradually I became aware of how fortunate I was that my back was strong and virtually pain-free. I continue to be able to do my job and remain quite active. And so, this is long in coming but I am very thankful to Dr. Beasley and her expertise. Thank you again very much! It was 3 weeks ago yesterday I had my surgery at your Lafayette location. I wanted to pass on my very positive testimony of all services you provided. EVERYONE was superb. Especially Dr. Villavicencio who did exactly what he told me and his scheduler, Steph, who was such a pleasure to communicate with. My intense pain was gone as I exited surgery and has not returned. However, I do know someone cut on me and that area is better every day. I want to thank everyone involved with my care from the initial contact thru billing and have been strongly referring your services to friends and associates. Please continue your excellent performance in the medical arena as we need more like you and your services. To Dr. Rajpal and Staff: Thank you for your expert help in keeping my spine lined up. You and your staff are wonderful and I feel very confident that I have a great doctor. Dr. Villavicencio performed my Transforaminal Lumbar Fusion (TLF) on L4-L5 on April 20, 2017. The results are miraculous. I am essentially pain free, I can stand as long as I like and walk as far I want without pain. Best of all, I can bicycle and do all the things I could not do prior to surgery. I am thankful to Dr. V and his team. All very professional. I feel as though I received the best care possible and the absolute best results. First of all I was very impressed and pleased with the overall friendliness and helpfulness of the office staff and the promptnes of my appointments. Dr. Villavicencio and Alex were super nice and my surgery was a success thanks to a very, very good surgeon. Thank you. You saved my son’s life. On June 4, 2016, my son was involved in a motorcycle wreck in Boulder. He had a traumatic brain injury, cracked spine, broken shoulder patella, broken arm, nine broken ribs, broken jaw, nerve damage, and many lacerations. He was 10 minutes from death with very shallow breathing. If his incredibly close friend didn’t call 911 and stay with him, my son would have died. He barely made it out of the ER. Andreas was in a medically-induced coma for almost 2 weeks and then spent a few weeks in ICU. After Boulder Community, he went to Craig and spent some time there. In not sure about the afterlife, or a higher being, but in our family’s opinion, you are right up there. My son is back. He looks incredible, walks and exercises regularly and talks absolutely fine. He has his faculties (he’s actually incredibly smart), his motor skills have returned (he’s playing volleyball in the Park), and is as normal as you and I. It’s absolutely incredible how well he’s doing. So well, that he’s moving to Oregon and is opening up his own business. On the anniversary of his accident, we came back to Community Health to say hi to his doctors, nurses, and others. It was important to him, and us (his family) to go back. When chatting about medicine, my wife and I speak about our son’s accident, and about how you, in particular, were critical to his and our, ability to cope. I just wanted to thank you for being you. You were calm in our storm, patient with our panic, and let us cry on your shoulders! Dr. Beasely -words will never do justice to you for saving our son. As of 2 weeks ago, Dr. Nanney was a stranger, as of today he is “MY HERO” not only is he brilliant when it comes to medicine, he is also very personable which I think is unusual for a surgeon. The majority of surgeons I have worked with the last 36 years are only interested in talking about medicine, but Dr. Nanney also helped ease my fears dealing with a major surgical event. I wanted to say that our experience at the Longmont office was wonderful. After a terrible experience at a different provider last week, I was a little apprehensive about our appointment. My concerns were completely unfounded. Even though our sweet 5 week old baby was crying when we walked in, we were never made to feel put down and were greeted with kind words and genuine smiles. We felt that we were listened to by everyone from the ladies at the front desk to Dr Nanney. We are so glad to be working with your practice and are very thankful for the kindness we encountered in your office. Dr. Rajpal – Thanks for moving on my spine surgery as fast as you did and now I am pain-free. Dr. Rajpal – you have taken away my pain with your great skill and tremendous care. You have given me my life back and I am so very blessed and grateful. I can’t thank you enough. You are an amazing individual and doctor! Thank you! Dr. Rajpal – My physical therapist was right when suggesting I see you for an opinion. After lots of work at therapy and daily at home therapy for six months I reached a plateau, and I still hurt. I’d had another neurosurgeon plus a spine ortho surgery but wasn’t happy with their inability to see and treat me as an educated registered nurse and experienced athlete. Dr. Rajpal did! my surgery went very well and I’m pain-free for one year now. Thank you! I just wanted to drop you a note to tell you how much I admire and appreciate the person you are. I am blessed with my referral to you. When I first met you I was impressed. You gave comfort in your demeanor. You are a teacher to your patients by taking the time to show and explain patiently. The icing on the cake, a most awesome surgeon! I don’t want to leave out how impressive your team is from the receptionist, the PAs and all. Your office is run like a well-oiled machine. you can’t get any better than that. Much gratitude. It gives me great pleasure and an honor to offer my sincere appreciation to you all for recently helping me get my life back. On January 10, 2017, Dr. Rajpal operated on my lower back which was causing severe pain due to degenerative disc disease. After careful evaluation under the supervision of Dr. Rajpal, it was considered absolutely necessary, surgically, to restore the L-3/L-4/L-5 area in my back to a functional capability. After 4 hours of surgery, 3 days in the hospital, 13 days in in-patient therapy, 6 weeks recuperation and 6 weeks of outpatient therapy I can honestly say I am making great progress at getting my life back thanks to Dr. Rajpal and everyone in this long channel of medical professionals from beginning to end. The expertise, professionalism, and compassion shown to me, my family and my medical needs was truly exceptional. I can only hope that I met your expectations as a responsible patient under your care during this time. Now, 3 months after my successful path to recovery, my wife, will experience the same professional services provided me as she will be under the care of Dr. Rajpal in surgery, as well. Lori and I know from first- hand experience that she will be well cared for by all of you. We are honored to have you all as our medical team, once again. Dr. Sharad Rajpal and the staff at Boulder Neurosurgical Associates should be proud of their accomplishments. You all are a credit to yourselves, your medical community and the State of Colorado. Dr Beasley performed an ACDF on C5 with cervical cage end of January 2017. Dr. Beasley has been professional as well as informative and attentive from start of treatment under her care during previous Fall 2016. I really appreciated that Beasley explained medical treatment as if she was speaking to another medical professional. At the same time, she does have a humorous side that can lend to creating a calm and relaxing environment regardless of the situation. But, is very direct and focused when the situation calls for it. She was very willing to share her thoughts and concerns while under her treatment. When surgery became the final option, I had no concerns or fears that day. She was professional and friendly and made sure team was focused and prepared. My recovery has been quick and her skills as a surgeon were evident in how I felt those first few hours after surgery. I had no issues with soreness in neck or trouble speaking or swallowing, issues that I have heard from others who have had similar procedures by different doctors in other states or hospitals. The incision sight was barely noticeable after only 4 weeks and continues to fade. Christie her PA is very knowledgeable and great asset to the team. Follow up appts have been mainly with the PA which I feel lets me know that Beasley entrusts and has the greatest confidence in Christie-PA. Both are great medical professionals and would highly recommend them to anyone needing treatment in future. Overall experience has been amazing and would return if any unexpected issues arise in future. Since surgery, I have been pain-free, stopped meds 2-3 weeks after surgery and started PT. the PT was surprised how well I was recovering. I feel this shows how skilled Beasley is in how well a person recovers from surgery like this. I will always remember her Dr. Seuss socks. As a recent surgical patient of Dr. Alan Villavicencio I would like to thank he and his staff for my excellent results and caring and informative care. I am from a medical care family and am very appreciative of the quality of care I received. We couldn’t be more pleased with our experience with Dr. Allan D. (Tripp) Nanney III. He showed genuine concern and exercised great care prior and during my sister’s cervical (neck) and lumbar (back) surgeries. He is an excellent and compassionate doctor. Though my sister’s condition warranted immediate scheduling, due to circumstances beyond her control, she had to postpone doing so. Though Dr. Nanney was concerned for her safety and wanted to operate sooner, he respected her decision to wait. He also respected her restriction against accepting blood for religious reasons which was very important to her. He suspected the surgeries would be very complicated procedures and he was correct. He did not rush through them but used the utmost care. He also kindly arranged for her to return home for her rehabilitation, which was preferred and working out well. My whole family highly recommend him to anyone needing his skills. I would like to thank Dr. Nanney for helping me get through a tough time. He always had my best interest first. Always professional and very confident which in turn made me also feel confident about my recovery. It is nice to know that there are young and intelligent surgeons out there. I have been a patient of Dr. Beasley’s for three years. I saw her for spinal cord stimulation surgery. I had been told by a world-renowned doctor who specialized in stimulators that it wouldn’t help for my problem. I tried many different treatments, none of which helped at all. I was seeing a pain doctor who did an external trial with the stimulator that effectively targeted the area and provided some relief. He referred me to Dr. Beasley who agreed to do the implant. It didn’t seem to help at first but after six months I noticed that I wasn’t having pain. I went a few days without using the stimulator and realized that the pain was completely gone. It was a miracle! That was three years ago and the pain hasn’t returned. It was uncomfortable having the stimulation in my lower back so I decided to have it removed. Dr. Beasley said that given the length of time without pain, the symptoms shouldn’t return. I am still recovering from the discomfort from having it removed but I am sure that will go away soon. I just love Dr. Beasley! She and her assistant have been so kind to me, offering reassurances and answering any questions. I recommend her highly as a neurosurgeon! From my first appointment with Dr. Bauer, he completely assuaged my fears. Dr. Bauer conveys such confidence (without even the smallest trace of arrogance) that I walked away from the appointment knowing I was in the best possible hands (literally). Dr. Bauer is personable, attentive, a great listener, funny, kind, compassionate and incredibly brilliant without being condescending. If someone is cutting into my brain I want them to be the smartest person in any room but also someone I can talk to who understands what I’m going through. His office staff is also super helpful (Allison, especially) and never once treated me like just another patient to bill (the folks in the billing department are wonderful, as well). They treat you like a person going through a difficult time, and they are there to do everything they can to make things better. My husband and family members who’ve met Dr. Bauer are also huge fans. He helped them feel at ease during a long surgical procedure. I am looking forward to seeing him for the next few years as my condition is monitored. He made a very nerve-wracking few months much more bearable. Thank goodness for my magician surgeon, Dr. Sharad Rajpal, at Boulder Neurosurgical & Spine Associates who got rid of the nasty (thankfully benign) tumor that kept me flat on my back in the hospital for five days post-surgery and in a back brace for eight-weeks. It was the source of my unsolvable back pain that dogged me from since the beginning of the year and was finally diagnosed via MRI in late July. 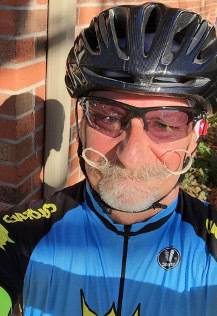 My six-month follow up is in mid-February and I hope to get cleared to resume biking, swimming, yoga, etc., thanks in part to the three cobalt-chromium titanium screws supporting my vertebrae and boatload of PT, Pilates and walking! I have known Dr. Rajpal for over a year. I had surgery 1/2015 by another surgeon for low back pain and unable to move my legs. The result was complete movement of my legs but the pain continued. Dr. Rajpal performed surgery on me 1/2016. He explained all that he was going to do and the special care post op. I went home on the 4th day postop never to have any more pain. To this day 10/5/2016 I AM PAIN FREE!!!!! I owe my deepest gratitude to Dr. Rajpal MD. I now can play Golf and hike all I want. Many thanks again. I was especially wary of having posterior/transforaminal lumbar fusion (TLIF) since my out of state sister had experienced the same procedure unsuccessfully, and had to suffer months until a second neurosurgeon corrected her first surgery. When I saw the website and read the testimonials for Dr. Villavicencio, I was convinced that I would like him to be my surgeon. I was impressed by reading of his expertise, the success of his patients, and the overall experience they had. I cannot say enough to praise Dr. Villavicencio and his team. Although his staff helped me to get a cancellation appointment, my condition had deteriorated quickly in the time before my consultation. Dr. Villavicencio was about to take a week’s vacation. When he saw me, he assessed that I should have surgery as soon as possible to avoid further and perhaps permanent deterioration. He recommended that I schedule surgery with his new associate for three days later. When I resisted, because of the confidence I felt with Dr. Villavicencio; on the spot, Dr. Villavicencio called his scheduler and tried to get an earlier date. When, he could only schedule it for 3 weeks out, he sent me home, saying, he would try to do better. The next morning, his staff contacted me to say that Dr. Villavicencio had decided to return early from his vacation to operate on me— only four business days later! Dr. Villavicencio’s staff were supportive and efficient in getting insurance confirmation and handling the details. Alex Ashton, the PA, was knowledgeable, available and helpful, as was the nurse. The entire experience was excellent, and Dr. Villavicencio even telephoned me at home, the first night that I was discharged. I definitely felt that my health and future were in the best hands possible. A month out of surgery, I am progressing well and walking without pain for the first time in 18 months! Dr. Villavicencio performed my C3/C4 discectomy & fusion in April 2016. I just have to say that he is an awesome surgeon and the absolute best at what he does. I made my first appointment with Dr. Villavicencio only because I thought I should get a 2nd opinion before having spine surgery. The previous surgeon I saw at Denver Spine Surgeons recommended a 6 hour surgery for C3-C7 with both an anterior AND posterior approach (basically rebuilding my entire neck! ), and 2-3 days of recovery in the hospital (followed by many weeks of recovery at home). The previous surgeon also told me that my current symptoms (numbness in my hands/fingers) would never improve, even after the surgery. I was so happy when Dr. Vicllavicencio described his recommended surgery for me: C3-C4 disectomy & fusion with an anterior approach — less than one hour of outpatient surgery and home the same day! And he expected my symptoms to improve after surgery. It was a no-brainer for me to choose Dr. V to do my surgery! So here I am nearly 4 months post-surgery, and I can only say that I’m so very thankful for Dr. V and his expertise, as well as for his staff. My recovery has been excellent, my numbness is almost completely gone & continues to improve, and I have absolutely no pain. I highly recommend Dr. Villavicencio without hesitation! Dear Dr. Rajpal: I wanted to express my gratitude for your help, advice, listening and support in order for me to make the decision to go forward with surgery. It meant a lot to hear your opinion, concerns and overall confidence that his was the right decision for me to return to my life. I sincerely appreciate the time you took with me. Thank you for all your time. After years of neck pain and a decreasing range-of-twisting-motion while skiing, biking, and driving my Pain MD ordered a MRI. This imaging showed C5-C6 and C6-C7 disc osteophyte complex with advanced facet arthropathy and moderate to severe foraminal stenosis. My Pain MD suggested that I immediately seek a Spine surgeon. My online research led me to a minimally invasive laser spine center in Texas that “treated patients suffering from degenerative spine conditions, herniated discs, spinal stenosis and other spinal and neck conditions”. I mailed in my MRI but the center responded that I was “not a candidate.” Since I also preferred to seek treatment in Colorado I soon located Boulder Neurosurgical & Spine Associates and Sharad Rajpal, MD. He and his staff helped me understand the complexity of my situation and displayed confidence that surgery could help me gain range-of-motion, reduce pain and protect me from spinal cord damage. The complex surgery has been a success and after much PT and personalized follow up I have fully returned to the sports I love. The original MRI hints that, over time, other areas of my neck may need attention but I have found my neurosurgical practic. Dr. Rajpal is the best doctor I have ever met. He spent 2h with me explaining my condition and treatment options. I am from the Springs and the drive is very well worth it. The surgery scheduling time was very reasonable! I will not go see any other Neurosurgeon but him anymore. He is absolutely knowledgeable, kind, and a very pleasant character. Nothing better could have happened to me than finding Dr. Rajpal! Surgery went very well. Outstanding work! The staff is very nice as well and very well organized. All in all a perfect experience. Thank you very much Dr. Rajpal! It has been six months since Dr. Villavicencio performed my lumbar and neck surgery. The change in my life has been dramatic. I am pain free and regaining strength and mobility. I am doing things, like touch the ground that I haven’t been able to do for years. I am no longer making decisions based on falling risk. I am constantly being stopped by friends who are amazed at how much younger, taller (apparently I was hunching a lot with the pain) and the sparkle I have in my eye. I would have been thrilled with just a portion of the improvement the surgery has made in my life. The surgery Dr. Villavicencio and his staff performed have literally changed my life. I cannot recommend having this treatment enough! I have had the misfortune of requiring 2 back surgeries but the unbelievably good fortune to have had Dr. Villavicencio perform both those surgeries. Both were complete successes. In November 2010 my L3, L4 & L5 were fused to correct herniated discs, stenosis, arthritis and a congenitally narrow canal. On August 7, 2015 I had an L5/S1 micro discectomy due to bulging discs. In both instances I could barely walk prior to surgery and in both instances I fully recovered and was able to resume all my athletic pursuits without limitation. Dr. Villavicencio truly gave me my life back. Dr. Villavicencio’s superior medical skills are unquestioned. He is the best at what he does. But what he did to help me heal goes beyond medical skills and I am forever grateful. Let me explain. In June and July of 2015 I had 2 epidurals to hopefully control the bulging discs. It didn’t work. Sometime toward the end of July I called Dr. Villavicencio’s office to make an appointment and casually mentioned that I thought I was probably going to need surgery again. I was told he was booked until I think it was early October. Gulp!!!! Dr. Villavicencio saw me on August 4, saw how bad I was, and operated on me on Friday, August 7. Fridays are always his day off and a long bike ride day but he came in to operate on me. What more can I say. In November Dr. Villavicencio and his staff performed my second and third back surgeries. I had to arrange my care from Alaska and Deborah on the office staff went above and beyond to ensure we had all the insurance requirements, documents and pre- surgical work taken care of before I arrived in Colorado. She knew what needed to be done and was proficient and more importantly genuinely interested in me and my care. Dr. V also has a number of PAs assisting him and I particularly want to thank Eric Busch. He was always very caring and very patient answering any questions. During my recovery he always returned my calls. Dr. V had done neck surgery for me a number of years ago and had impressed me with his knowledge and skills. When I needed a second neck surgery and serious lumbar surgery, I knew exactly who to go to. He is the only doctor I trust to work on my back. He is a truly gifted professional. He did his usual fantastic job and for the first time in ten plus years I am pain free. 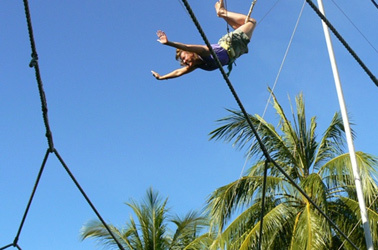 I am also free of the terror I lived with for fear of falling (which I did regularly) or rupturing another disc. It’s amazing how much better life looks without pain! In my case the reason I can say that is the skills and caring of Dr. Villavicencio, Eric and Deborah. If I ever have back issues again I will be back to see them. I wouldn’t trust anyone else. My son was a patient of Dr. Nelson in August and September of 2015. He fractured his skull, suffering a TBI. Thank you, Dr. Nelson, for all your kind care and assessment. My husband and I were obviously terrified, however your calm explanation of his injuries, plan of care and prognosis helped us ‘get a grip’. He completed about a month of out-patient rehab and is returning to school in January. Thank you so much for your expertise and gentle care of my son. Dr. Beasley performed my cervical fusion for removal of a meningioma that was pressing against my spinal cord on 9/14/2015. Prior to the procedure I was unable to walk without dragging my left leg and was gradually becoming weaker in both lower extremities. I am now able to walk with the aid of a cane and becoming stronger every day! I was treated with respect, kindness and professional expertise during every encounter with Dr. Beasley and her staff. She made me feel at ease. I believe I received the best care possible and that they went the “extra mile”. I am so grateful and I pray for God to bless the doctor and her staff. Dear Dr. Rajpal and Team, I just wanted to take a minute to thank you for taking such great care of my dad. You made the back surgery experience very easy and carefree. You cam highly recommended to us by an employee at NeuroPace, a company in California. We will definitely pass on your name to anyone looking for a neurosurgeon. Thank you! I had the great fortune of having Dr. Rajpal do surgery on my lower back in July of 2015. From the very first appointment to the last post-op visit I experienced nothing but professionalism, respect and kindness from the entire staff. My surgery went perfectly and my recovery period was short and free of complications. I am very grateful for the wonderful care I received from Dr. Rajpal and his staff. Anyone looking for a great neurosurgeon need not look any further – you have found it here. Please pass along to Dr. Nelson and everyone there that I am thankful daily for the spine surgery you did about 2 or 3 years ago…. I always refer friends when the opportunity presents. Thanks for fixing my back! Thanks Dr Rajpal and team! You were spot on with your analysis of my back nerve problem, told me exactly what I could expect with the surgery and today I am pain free and walking, sitting, sleeping better than I have in a long time. Everyone I interacted with at the office and hospital for surgery were professional and kind. Great Job! When you read the patient testimonials, please take them with a grain of salt. Of all the docs at this partnership, Dr. Villavicencio has the least favorite patient reviews. I am guessing that is because he is blunt, direct, and a man of few words. He is not a hand-holding post-op surgeon. He is all business. These factors may rub some people the wrong way. I asked a lot of questions before having spinal surgery. My final question asked why I should hire him. He responded “because I’m the best” That response, alone, might sound arrogant and turn a lot of people off, but it was exactly what I wanted to hear. It turns out, I made the right choice. MRI’s said that my procedure would be a fairly straight forward 90 minute removal of a spinal cyst that involved a 6 inch incision, but once Dr. Villavicencio got in there; he discovered a 15″ cyst that was fully imbedded in the sheath that surrounds my spinal cord from T3 to L1. It took 4 hours under high magnification, to delicately get it all out. He made his initial incision and did not stop until it was entirely removed. No complications. That was July 9th. Today is the 20th. I have been for two half mile walks without a walker or crutches, refused all narcotics two days post op, and am being released from this recovery facility tomorrow. The man is not just “the best”. He is a blunt, direct, straight forward technical genius. Take him at his word … he’s the best for a reason. Thank you, Dr. Villavicencio.When you read the patient testimonials, please take them with a grain of salt. Of all the docs at this partnership, Dr. Villavicencio has the least favorite patient reviews. I am guessing that is because he is blunt, direct, and a man of few words. He is not a hand-holding post-op surgeon. He is all business. These factors may rub some people the wrong way. I asked a lot of questions before having spinal surgery. My final question asked why I should hire him. He responded “because I’m the best” That response, alone, might sound arrogant and turn a lot of people off, but it was exactly what I wanted to hear. It turns out, I made the right choice. MRI’s said that my procedure would be a fairly straight forward 90 minute removal of a spinal cyst that involved a 6 inch incision, but once Dr. Villavicencio got in there; he discovered a 15″ cyst that was fully imbedded in the sheath that surrounds my spinal cord from T3 to L1. It took 4 hours under high magnification, to delicately get it all out. He made his initial incision and did not stop until it was entirely removed. No complications. That was July 9th. Today is the 20th. I have been for two half mile walks without a walker or crutches, refused all narcotics two days post op, and am being released from this recovery facility tomorrow. The man is not just “the best”. He is a blunt, direct, straight forward technical genius. Take him at his word … he’s the best for a reason. Thank you, Dr. Villavicencio. Before scheduling an appointment with Dr. Rajpal, I was braced for being scheduled for neck surgery as I felt I tried every option available. When Dr. Rajpal suggested dry needling I had no idea what that was. He felt I would be a good candidate but in the event it didn’t work he’d order me an MRI to see if surgery was the only answer. He said needling would be much more painful than acupuncture, which I never found painful or even uncomfortable. I was quite anxious prior to my first needling appt. with a physical therapist. I actually found it very similar to acupuncture but with more burning. I was told there would be moderate to extreme soreness for up to a couple of days…and there certainly was. I seemed to be slightly better after each treatment but the 5th one turned the corner as the therapist applied an electric pulse to the needling. After the soreness wore off after 2 days, I had zero burning after sleeping for the 1st time in months. I was told that it could take up to 9 treatments before I get relief so I really was really on cloud 9. I’ll see how long I can coast before I need to have another session. To think that it took a surgeon to make me aware of a modality I was never aware of. 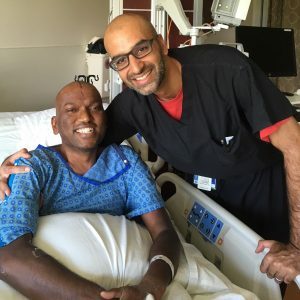 Huge KUDOS to Dr. Rajpal. The 1st face you see has a smile and a confident caring demeanor. That is Dr. Beasley, also it’s good because she knows sports and rides bikes .. just not up hill. Here is my story. Feb 27th 2015 I started to experience horrible pain in my lower back. I do have a history of a couple of bad disks so I thought maybe that was the cause. Upon having an MRI done the next week I was informed to go directly to the hospital emergency room. I went to the Good Sam Exempla in Lafayette. On March the 10th, 2015 I had emergency surgery on my spine due to a staff infection. Dr. Beasley and her PA Christie were compassionate, caring, very focused on my needs and reacted to my pain management very quickly. Every followup appointment was important to them, never did they seem uninterested in my post surgery. If anything they were more attentive to make sure I was recovering properly and that I was happy with my progress. Today May 27th I was given a clean bill of health from Dr. Beasley’s office and I am most grateful.. If you ever need the services of a great Neurosurgeon I highly recommend you contact Dr. Beasleys office. I cannot thank you and your staff enough for the care I have received. See you on the roads and yes even the uphill ones Doc. I started noticing symptoms of my Parkinson’s back in 2006. Over the years, it became unmanageable and harder for me to hide, so my wife and I went looking for solutions. We were lucky enough to wind up in the care of Dr. Kara Beasley. She performed DBS Surgery on me last month and I am going back to work next week. I have no tremors! I feel like I am twenty five again. It is like I just awoke from a long and very frightening nightmare. It is amazing, as was Dr. Beasley and her team. She seemed to be as excited for us as we were. She was very easy to talk to and spoke to us in words we could understand. Christie was just great. The day she turned on the generators was the best day I have had in years. She is very patient! Toni and the office staff are also wonderful. They helped in every way they could. We could not be more pleased with the outcome of this surgery. I never knew I might one day get my life back!!! Thank you so much to Dr. Beasley and her team. I am writing to you in regard to an invitation to express my deepest gratitude to the Boulder Neurosurgical and Spine Associates. I will attempt to be brief….which is not in my nature. I drove from Michigan to Colorado to visit my eldest daughter as I had a few months prior to accepting a new position as a seasoned Licensed Clinical Social Worker. I was having trouble with my left leg as I believed I had a soft tissue injury from my dedication to my yoga practice. After a few days my wise daughter insisted I seek a medical opinion as she felt my injury was much more serious! She was right. She took me first to urgent care where they checked me out and prescribed a pain medication stronger than my Advil and ice routine. They instructed me to go immediately to an ER if the pain persisted. The pain increased. My daughter and I went to Good Samaritan ER where I was X-rayed. The discovery was serious a tumor on my L-4 vertebrae. I was given an appointment with an oncologist the next day. The oncologist checked me over and discussed my medical needs.The first being an appointment with Dr. Rajpal to assess my situation. Dr. Rajpal was a serious focused professional and spoke with me about how fortunate I was NOT to have injured myself more seriously due to the placement of this tumor. He spoke clearly about my need for surgery to remove the tumor ASAP. He also spoke to the possibilities of needing to assess the damage done to my spine from this tumor. Only after the surgical removal of the tumor would he know what needed to be done to reconstruct my spine. My daughter was present so she could take notes and clarify Dr. Rajpal’s report as I was at that time highly medicated due to the severe pain from this tumor. We scheduled surgery. In the meantime numerous tests and scans were done in preparation for the surgery.Dr. Rajpal was able to secure my confidence in his skills before and after the surgical procedure. In the operating room he was able to review with me what his “game plan” was. This is a skill to be able to communicate this intensely specialized operation to a novice of a patient(ME!). The next day I was in a soft brace needing to have a standing X-ray done to assess how the internal reconstruction of my spine had worked. A few hours later a colleague of Dr. Rajpal gave me a report on the success of the surgery. He was thorough and so kind in his report to me. He explained that my vertebrae had become so soft from the intrusive tumor that there was a need to reinforce the reconstruction.This needed to be done as soon as the next day. He answered all my questions and concerns. I felt such a strong level of confidence in this report and guidance that I was prepared emotionally to continue this journey of healing. I was immediately measured and fitted for a hard-shell brace that was created in another state and express delivery for the next day following my surgery! Another day in the operating room.I had not felt any emotions other than gratitude for Dr. Rajpal’s expertise and efficiency in making my situation the best it could be. The following day I again had to do a standing X-ray this time in my “clam-shell” brace. Dr. Rajpal met me in my hospital room later and reported feeling confident in his attempt to reinforce the reconstruction of my spine. He drew me what appeared to be an Eiffel Tower which was approximately what he had constructed for my spine.I recall him stating something like: I have done my best now it is up to you to do your best in recovery. I was pleased to meet the other members of his practice as they checked on me regularly during my hospital stay. I went on to a skilled nursing facility to continue Physical and Occupational therapies.I had follow-up care in his office with wonderful Martha who removed my stitches and shared in my delight when I could manage walking across the examination room without a walker…I felt like a stiff legged Frankenstein but I did it! After another surgery to remove my cancerous kidney, I had a second follow-up appointment with Dr. Rajpal along with updated X-rays! The results of my hard work with PT and OT and Dr. Rajpal’s neurological skills I was allowed to come out of my “clam-shell” and return to using my soft brace! I was thrilled! Martha shared in my accomplishment by praising me in my commitment to heal. I was truly recuperating! In late March my two other adult children(twins) plus my eldest daughter(Caregiver extraordinaire) joined me for my next appointment with Dr. Rajpal. By this time I had been in my daughter’s home with continued Home-care PT, OT. Wearing my soft brace and sporting a fancy cane I strutted into the exam room with a huge smile on my face. I was thrilled that Martha was on that day as she inspired me to be brave and continue to strive to improve. Yes, I was showing off my strut. After a review of very fresh X-rays Martha and Dr. Rajpal answered my adult children’s questions. He and Martha stated I was free from using even my soft brace! Dr. Rajpal and Martha gave me the “thumbs-up” as I walked on with my cane. Along with my oncologist,urologist and Dr. Rajpal together they saved my life…this is not an overstatement in the least.I was encouraged, supported, informed and included in my recovery every step of the way. My gratitude is acknowledged everyday! I am looking forward to my six month follow-up appointment as my goal is to truly sashay into the office having retired my cane. A million thank yous are not nearly enough to Dr. Rajpal, Martha and his team of professionals! 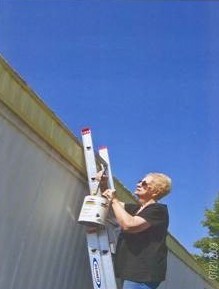 Dorothy “Dottie” C. MSW/LCSW/CAC (retired). Dr Villavicencio and Alex are amazing! Our family had a lot of questions, they were very patient and kind. The surgery was successful and I am so thankful to you all. In October you performed a lower back surgery for my husband Floyd. The results are miraculous! For the first time in four years, Floyd is pain free. I the impact on his life is tremendous: he walks comfortably, manages distance, smiles easily and has a positive attitude that has increased so much due to your perfected skill and kindness. We appreciated your post-surgery follow up phone call and the sense of personal caring you brought to the situation. I wanted to thank you because in caring for my husband you have helped me as well. I had my first back surgery in May of 2011 after living with excruciating back pain that kept me from driving the car, even standing up straight, or just living my life. Dr. V. through his expertise gave me back my life at that time, and I was back to myself in a few months. I was 78 years old at the time. Last June, 2014, I unfortunately required another surgical intervention as osteoarthritis had caused more stenosis and nerve damage to my left leg causing me to fall to the floor without warning. Dr. V. once again went in and repaired the damage being done to and around my spine and once again I feel he has given me my life back. I am 80 years old now but am doing well and would say that I would never hesitate to accept this option as opposed to being in a wheelchair. The recovery is not easy and takes time but it is so very worth it and Dr. V. is as far as I am concerned the best there is. This thank you is way overdue. Dr. Nelson is the greatest surgeon in the world!! I had back fusion surgery two years ago this month and I got my life back. I originally went to see him for a second opinion about my back problems. I had been suffering for a few years – not able to stand up straight for the first hour I was out of bed every morning, chronic sciatic pain, and not able to walk but a few steps before resting. Dr. Nelson offered me a more reasonable surgery plan than I heard initially and I immediately felt confident that I had found my answer and my surgeon — and nothing has happened since that day to change my mind. My surgery went great – I can honestly say I have had no pain since the minute I came out of recovery. I was diligent with my recovery instructions and physical therapy. My biggest fear now – 2 years later – is that I’m going to forget someday to be grateful for Dr. Nelson and Sara and Mike and Jennifer. I never want to take being pain-free for granted. Thank you all so much! I won’t be able to express enough good things about the success of my back surgery. From the first time I met with Dr. V. and Eric to discuss my options concerning my lower back I sensed and felt a confidence from them that there was a remedy for what I was experiencing. To now be able after the fusion surgery to take walks and perform work at the ranch is amazing as I was unable to do either without numbness and pain in my legs and lower back. My recovery has far exceded what I had hoped for pre-surgery! After being in pain for more than three years and going through a failed back surgery, there are no words to adequately show my appreciation for what Dr. Villavicencio has done for me. I could not walk or stand more than seven minutes at a time without being in excruciating pain and would have to sit down. After a five hour surgery, July 10, 2014, which included fusing L1-L5 with rods and screws, and replacing two discs with spacers, I sat in a chair the same day. The next day I walked to the end of the hospital hall and climbed about five stairs. I suffered no back pain. After five days, I was ready to ride 450 miles home. Dr. Villavicencio, his PAs, and staff were professionals in every way. If I ever need a neurosurgeon again, I would want to travel anywhere in the world to keep Dr. V as my doctor. This note is a long time coming. THANK YOU for helping me get my life back and getting my back to marathons. I ran my first post-surgery on October 12, 2014 – 5 ½ months after surgery. It was slow, but it was pain free and one of my most memorable to date. Coming to Boulder was the best decision I’ve ever made. Thank you for truly understanding athletes and giving us hope! Thank you for the wonderful care. I had surgery on Oct 2nd and everything went well. Dr. Rajpal was friendly and caring. He explained things so I could understand. His staff is also great especially Erica the PT. I am about nine weeks out now and feeling great. This is a life changer! I have had neck problems for many many years now and have had two prior next fusions. In October 2012 I began having issues with my lower back as well. My primary care doctor referred me to Dr. Rajpal. Dr. Rajpal has not only been able to help change the quality of my life with his surgical expertise, he has helped me through some very difficult health care decisions with his honesty and straightforwardness. He answers every question you have, and you never feel rushed when you have your appointment with him. His whole staff is actually amazing! As of this date, he has done one neck surgery, one back surgery and I’m preparing for my second back surgery in December. I have absolutely no nervousness or trepidation because I know that I’m in very good hands. I would highly recommend Dr. Rajpal and BNA for any of your neurosurgical needs!! In 2009 I went to a Spine Clinic in the Midwest for an opinion on my back pain. By the end of the day I often crawled up the steps to the second floor to go to bed. I was told that when the pain became too much to bear that they would do a fusion on my lower spine. The surgeon pointed out that the fused vertebrae would put more stress on the adjacent vertebrae, and it was quite possible that one spine fusion would lead to another, and another down the line. I could see life as I knew it, as a very active person, would be over if I went down that road. I made an inquiry on an online forum for triathletes and two very active and very fit women referred me to Dr. V and BNA. Each had gone to him for surgery and each was very pleased with the results. I emailed, sent an MRI, and talked with Dr. V on the phone. He went out of his way to work me in during my small window of opportunity to have surgery. He did a MD in Jan of 2010, and I am much, much better off than before. I can still bike, hike, and work pretty much pain free. His associate, Bob Cranny lined me up with new exercises to make a part of my life. These guys and their associates probably saved my life. I would recommend that anyone take the time to talk with them before submitting to more making life-altering decisions about back surgery. I recently had to have a fusion in my upper neck. I had never had any real surgery (other than a knee scope) in my life. When I was referred to Dr. Rajpal I had no idea what to expect. When my wife and I made our first visit we were both very impressed with Dr. Rajpal. His knowledge was incredible and he never once rushed us even with all of our questions. There was a potential for some complications (swallowing for one) which Dr. Rajpal had already told us about prior to the surgery. The day of the surgery Dr. Rajpal made me feel at ease as much as possible. The surgery went well and I didn’t have any complications. We’ve had two follow up visits with Dr. Rajpal and I am now beginning physical therapy. I want to say thank you to Dr. Rajpal and his staff (which are also incredible to work with) for helping through this process. I am very thankful that I was referred to Dr. Rajpal. I had disc surgery on June 17th 2014. I was having terrible pain and spasms with every move for months before finding Dr. Rajpal. Dr. Rajpal was very compassionate to myself and my worried husband. The difficult surgery was successful. I am now pain free and able to move on with my life. He is a very skilled and compassionate surgeon. A note of thanks is due to Dr. Beasley, not just for taking my case and taking care of me, but for looking me in the eye yesterday and making me understand that being post-concussive doesn’t stay crummy forever. I’ve been wanting to get back to feeling like myself for several weeks, and now I actually believe that might happen. That means a lot. Thank you, Dr. Beasley. You rock. We loved working with Dr. Rajpal! He was very thorough in answering our questions and made sure that we understood all the risks before we committed to surgery. My husband and I were so impressed with the amount of time he spent with us in our initial visit, and his understanding of the difficult position we were in with two young children and a mom in a lot of pain due to a large herniated disk. He has a wonderful bed-side manner, and was so patient with all of my post-op questions. I’ve recommended him to a few friends already. Thank you, Dr. Rajpal! I wish more doctors were like you! I had surgery in December, 2013, to repair a herniated disc. I had had two other back surgeries (by a different doctor) and expected a long recovery time, particularly since Dr. Rajpal would need to connect to previously installed (and complex) hardware attached to my spine. Surprisingly, the incision was much smaller than I expected, the pain and need for narcotics was minimal and my recovery was rapid. So much so that I was completely pain free and off any meds within a month. As of the time of this writing, it’s been 6 months since the surgery and I routinely walk several miles per day, do water aerobics and in general feel about 10 years younger. I’m still on a pink cloud after having had relief of so much pain and immobility prior to surgery. My name is Tyler Kyffin and I am a 36 year old farmer from Center, Colorado. I am taking time to write a testimonial concerning Doctor Alan Villavicencio in order to give credit where it is due. I had an accident in 2010 where I fell from off of a piece of farm machinery, I knew then I had hurt myself but brushed it off and went back to work (I thought I was the toughest guy I knew). I had deep lower back pain for 2 years which I treated with chiropractic, stretching, ibuprofen and by simply ignoring it. I had an incident in November 2012 where I had gone to see my chiropractor and I mentioned that I felt as though I needed to be placed in a medieval rack; it just so happened that he had one, although he called it a traction table. After being placed in the table for one session (which I take full responsibility for, as I did not communicate well the severity of the pain that I was in, for if I had I’m sure my chiropractor would not have suggested that treatment) I found that within one week I had lost control of my right leg. I was unable to walk for 24 hours but as a few days passed I did regain use of my right leg. I spoke with a friend of mine from Pueblo who is also a chiropractor and told him of my symptoms. He told me to go see Alan Villavicencio in Boulder. 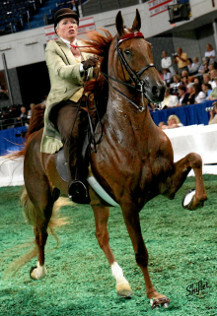 The picture is of me and my five-gaited American Saddlebred, Pie Crust. We finished 9th in our division at the 2013 World Championships held in August in Louisville, KY. We had a blast, thanks to Dr. V and the BNA team’s work on my neck! I was hit by a golf cart in March and then a ladder collapsed under me in June and I fell on my tail bone crushing it. During my stay in the hospital Dr. Beasley saw me and found a fractured T12 vertebra and had me wear a brace for 3 months. My experience with Dr. Beasley and especially the staff at Good Samaritan Medical Center was of the highest professionalism, treating me and making sure I was healing. I recommend BNA for any back problems anyone may have. I recently had DBS surgery performed by Dr. E. Lee Nelson and his wonderful and capable staff. The surgery was very successful and I am thrilled to have my normal life returned after years of suffering from Essential Tremor and months of severe tremors. Dr. Nelson was a very caring and attentive physician to myself and my family. I also want to thank Jenna from Medtronic for her time and attention in programing the pulse generators. I am now back to doing all the things I love to do – being an active community volunteer. A million thanks to Dr. Nelson, his staff, Medtronic and Good Samaritan Hospital staff for all their TLC. Dear Dr. V, It’s been a little while since I last wrote, but I’ve probably thought and talked about you and your team every single day since you operated on my back: I couldn’t be happier with or more grateful for the surgical work that you did, as well as the care and attention that you provided after the fact. When I first talked to you about surgery, I think my quality of life was as close to zero as it’s possible to get: I couldn’t do anything without pain, and it impacted almost every facet of my day-to-day existence, to the point that I had essentially forgotten what ‘normal’ life could be like. Just before surgery, you asked me what I hoped to get out of it, and I said that if you could get me to the point where I could sleep through the night, I’d consider the operation a triumph. I had a T6 and T7 fixed by Doctor Rajpal. He is the best in the world. His assistants Justin and Sara are great too. Dr. Sharad Rajpal was very professional and I received excellent personalized care. He gave me an unexpected diagnosis, but handled the situation with great tact. He spent time explaining my medical problem and what treatment I needed to receive. He gave great care before and after surgery. Justin Call the PA was also very informative and took time to make sure I understood the procedure. I received extraordinary medical care and emotional support which was instrumental in my recovery. I highly recommend Dr. Rajpal. With my first post-surgery step, I no longer had the severe pain previously experienced. Another reassuring outcome was that I had no discomfort with the couple of rods, some screws and a “cage” residing inside me! If you are needing a surgeon with the utmost skill in listening, understanding, diagnosing, explaining, operating, and patience, Dr. Rajpal is your surgeon. I recently had surgery by Dr. Sharad Rajpal with Boulder Neurosurgical & Spine Associates on April 25, 2013. WOW! I have been pleasantly blessed with a very successful surgery. Now I’m no “spring chicken” anymore and have had many surgeries in my time including one in the problem area some 30 plus years ago. Dr. Rajpal told me we could expect 60 to 65 percent results after surgery – I think we’re probably at 90 to 95 percent. WONDERFUL! Upon my first consultation visit with Dr. Rajpal I felt very comfortable. He explained the situation very thoroughly and has a great sense of humor. Thank you Dr. Rajpal for everything, also enjoyed working with your entire staff and wish the best for you all. I am so grateful for Dr. Beasley. I was told by several other doctors my back couldn’t be fixed and I’d have to just manage with pain meds. I tried everything, even a spinal cord stimulator. After visiting with Dr. Beasley she was convinced she could fix my back. I am so thankful I took the chance and let her do the surgery as I’ve been in pain every waking moment and now for the first time I’ve had several moments completely pain free. It has only been a couple weeks since surgery and I can tell a huge difference. I would recommend Dr. Beasley to anyone. Dr. Beasley, her associates and the hospital treated me with so much respect and dignity and I am so grateful to them all. Thank you so much. I had been suffering low back pain with associated pinched nerve, leg pain and muscle weakness for nearly 20 years. In recent years the symptoms progressed so badly that I wasn’t able to do any normal daily activities such as standing and walking, and had essentially become partially disabled. I knew I needed surgery but was having difficulty finding the right surgeon and the courage to commit to doing it. Finally, luck was on my side and I was introduced to Dr. Nelson and knew almost instantly I was on the right track and I now had the right surgeon who would help me in getting my life back to normal. Dr Nelson and his excellent physician assistant, Mike Kiley, and other staff, performed a single level TLIF just two weeks ago today. As I write this testimonial I can tell you that the procedure they did was done perfectly, the chronic pinched nerve problem has been FIXED and the pain that had become such an antagonizing part of my life is GONE. I am forever grateful to Dr Nelson and all his staff for taking such good care of me and their commitment to taking their neurosurgical expertise to the highest possible level. After three falls and hitting my head each time it was determined that I needed a pace maker. I met with Dr. Beasley for a routine check before being released from the hospital and at that time was diagnosed with a small hematoma on the brain. After a follow up scan two weeks later I was told to go to the hospital immediately. Dr. Beasley said my hematoma had grown and I might need surgery. She did not rush to operate, which I was grateful for, but watched over me for a few days while I was in the hospital, during which time the hematoma started to subside. After many scans and out-patient visits I am glad to say I have been released from care and all is well. During my ordeal I was treated with respect by Dr. Beasley and her staff, was always listened to, and felt my care was excellent. I highly recommend BNA to those who need quality care. My entire experience with Dr. Rajpal and his PA, Justin, has been excellent, from my first appointment, to pre-op and post-op. They answered all my questions with patience and careful consideration. I had anterior and posterior [cervical spine] surgery and just a few hours after surgery could immediately feel the difference in my neck and spine, and felt much better. My outcome was exceptional, I spent minimal time in the hospital, am doing well in therapy, and looking forward to getting back to work. I would absolutely recommend Dr. Rajpal to anyone. I just wanted to send a note to express my deep appreciation for the care provided to me by Dr. Villavicencio and his PA, Alex. I had back surgery in 2010 and 2011 and both surgical procedures went very well. Dr. Villavicencio proved to be an excellent surgeon, who cared about my health and well being. My trust and confidence in him never wavered, because he took time to explain what he was going to do and what I needed to do to recover as quickly as possible. Alex met with me during my recovery period as well, and he did an excellent job explaining my level of progress and he ensured that I was progressing as anticipated (making physical and mental therapy suggestions along the way). On Friday, March 1, 2013, I had my final checkup with Dr. Villavicencio and Alex (2 year), and I was given the green light to resume my normal living activities. Back surgery can never be pleasant, but I know it could have been worse for me had I not had Dr. Villavicencio and Alex caring for me. Please pass on my thanks to them again! I have recommended Dr. Villavicencio to other people I know who have expressed a need for a neurosurgeon, and I will continue to do so. Last year I was in surgery for chronic lower back pain (L 4 and L 5). Sometimes the pain was way beyond pain. For several months I had been unable to walk very far or stand for more than a few minutes at a time. One of my favorite past times was attending art gallery receptions. I found that I was looking for a chair to sit down on before I looked at the art work. Now all that has changed. Thanks to Dr. Villavicencio, Eric and Alex, I am back to my energetic self. I can honestly say that right from the time I woke up from surgery, I have not had even the slightest pain anywhere. I just had my 6 month checkup and passed with flying colors. When my friends ask me how I am doing, I sing the praises of Dr. V and his incredible team. Many thanks to all of you from a 75-year-old lady who now feels ready to do cartwheels. I would like to thank Dr. V, Eric & Alex for the successful surgery on my neck, also for the care and concern about my health in general. I will miss not seeing all of you. Dr. V., I will miss the eggs! My husband agrees. I received the most excellent care from Dr. Rajpal and his team. I have been a rehab RN and worked with many surgeons and was most impressed with Dr. Rajpal. I had emergency back surgery and am feeling great, back on my feet and pain free. I am grateful and have recommended many friends with back/spinal issues go Dr. Rajpal and Boulder Neurological & Spine Associates. I wanted to let Dr. V know that since my operation on July 23 I have been pain free, and on track to recovery. Dr. V and his staff were very professional, and obviously competent in treating me. They took a conservative approach to my care and tried alternate therapies before recommending surgery. Dr. V was referred to me by my daughter who was cared for approximately six years ago. Now I recommended my son who lives out of state to Dr. V.
On June 4 I had a Kyphoplasty. I had been in pain for over a month. Dr. Rajpal was wonderful. He was so honest and caring. He said he would be there for me after surgery. I have nothing but praise for him. I recommend Dr. Rajpal to all my friends. Still having a blast just under one year after neck fusion #5, woo hoo! It’s amazing what changes a year can bring. V, this date last year I was on your surgical table. 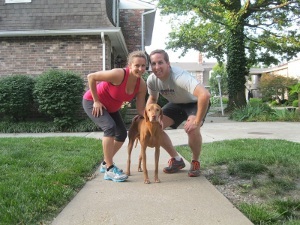 This morning, Tim and I celebrated the surgery year anniversary and starting the 7th month of pregnancy with a morning run. I have everything I was working toward and hoping the surgery would make possible now. I just wanted to send a quick note to thank everyone at Boulder Neurosurgical & Spine Associates for their professionalism and care. Dr. Rajpal is a very nice and competent man and I felt I was in good hands with him. I really appreciate that when I called with a question or a problem that he personally called me back to answer questions and make sure that everything was okay. He didn’t make me feel like I was putting him out by bothering him outside of my appointments. I would definitely recommend Dr. Rajpal to anybody. Thanks again! Dr. Rajpal performed surgery on me 3/29/12 for major back issues. This is my third back surgery and Dr. Rajpal also had to repair some issues from a previous surgery I had in 2008. At the time I had my first appointment with him I was having major leg pain that progressed to severe. I am so pleased that all of my leg pain is now gone!! Dr. Rajpal was always helpful, answered all my questions and seemed truly concerned about me as his patient. From my experience, I would definitely recommend him if someone I knew was having back problems and would also request him as my surgeon if the need for surgery arose in the future. I am very happy to provide a testimonial to the skills and care of Dr. Alan Villavicencio. You might say “I lived to tell about it.” Headaches, stumbling in my walking, and changes in my handwriting led me to all my doctors–every one said they thought I was having stress headaches, which was indeed a true possibility–but one, my oncologist, asked me to get a brain MRI. The MRI showed a sizable tumor in the right cerebellum, the part of the brain that is responsible for coordination. My oncologist conferred with Dr. V about the findings, Dr. V reviewed the MRI and determined that surgery was necessary, as opposed to a lengthy regiment of radiation, in order to save my life. The tumor and its swelling were very near to the brain stem, making it a life threatening situation. I had surgery on Nov. 10, 2011 for herniated disc L4-L5. The pain was terrible for weeks before I finally decided to go with surgery and I’m glad I did. Dr. Rajpal did a great job on me! I’m doing great. Most of the pain is gone. I’m walking normal and back to work. It feels like I might get feeling back in my foot and lower leg. Most of the function has returned! Dr. Rajpal and Sam Lopez do miracle work! They gave me my life back! My whole life has changed since Dr. Nelson implanted my deep brain stimulator three months ago. I don’t have the tremors I used to have, and my general outlook on life has improved very much. I now feel like going out and interacting with society! One of the biggest gifts of DBS has been my new ability to just sit still or go for a walk without tremor. The worst part about DBS was the bad haircut! Ha-ha! Since having DBS in August of this year (2011) I can drive my own car again, sit and sew at my sewing machine again, ride my horse again, button my own buttons, garden, and I even plan on traveling out of state by myself by plane for the holidays. Dr. Nelson and his staff at BNA are nothing short of top notch in every sense of the word and come highly recommended by me. Dr. V, thank you very much for your help yesterday. You have been just great! The severe pain from my right leg and lower back was gone as soon as I began walking. Also many thanks for the picture and keeping my sister up to date while I was still at the surgery room. (The image you sent gave me an idea how much of the gel seeped out from the disc and how bad it was). Now I understand that the surgery was the only option for me. Again, thank you for the wonderful performance. I am an 87 year old physician who practiced family medicine in the North Denver and Wheatridge areas of Colorado for 37 years. I retired in 1993 as a lifetime fellow of the American Academy of Family Practice and met all of their standards regarding continual post-graduate medical education. I am sorry that I did not continue this education adequately after retiring because I have paid a high price for ignoring technological advances in neurosurgery that have cost me dearly in the past year. I am writing this letter in hopes that I can update people who don’t know of these advances. I think that recounting my experiences can be helpful in making the right choices for treatment. When I developed a limp at age 86 I got an examination and x-rays by my old family doctor who diagnosed spinal stenosis. He had previously referred my wife to an orthopedist for an hour-long procedure on her neck that went well. When my symptoms worsened I self-referred to this orthopedist and subsequently underwent a 3 hour operation that initially helped but ended disastrously. I developed such severe back pain 3 months after that surgery that living with it was intolerable. I went to the emergency room at Boulder Community Hospital, was hospitalized and then introduced to Dr. V, who explained that the surgery I’d had could not possibly have given long-term relief. He was upset that I had not kept up with the technological improvements that have been made in the field of spinal surgery and that I was experiencing now the negative result of this ignorance. He went ahead with corrective surgery involving the use of technology and computerized techniques that gave me full advantage of the latest advances. The surgery was prolonged because of the previous intervention but Dr. V gave me all the time that was needed to fully complete the procedure. I am now recovering 3 ½ weeks after Dr. V’s surgery. I have almost no back pain. Boulder Community Hospital has been supplying post-operative and rehabilitative services that have been enlightening and instrumental in my recovery. I am looking forward to more years of rewarding life. I am extremely grateful to Dr. V for having prepared himself so thoroughly, developing the skills and judgment that he now uses to enhance the health of our community and relieving the pain and disability associated with spine problems that are increasingly afflicting our aging population. This was Team Jamie, Dr. Parker was there with us at the finish. Thank you Dr. V for bringing my girl back to me…again and again. We will all be there again next year (for the BoCo Loco), and the next year after that. I had surgery on Nov. 10, 2011 for herniated disc L4-L5. The pain was terrible for weeks before I finally decided to go with surgery and I’m glad I did. Dr. Rajpal did a great job on me! I’m doing great. Most of the pain is gone. I’m walking normal and back to work. It feels like I might get feeling back in my foot and lower leg. Most of the function has returned! Dr. Rajpal and Sam Lopez do miracle work! They gave me my life back!. My whole life has changed since Dr. Nelson implanted my deep brain stimulator three months ago. I don’t have the tremors I used to have, and my general outlook on life has improved very much. I now feel like going out and interacting with society! One of the biggest gifts of DBS has been my new ability to just sit still or go for a walk without tremor. The worst part about DBS was the bad haircut! Ha-ha!. Since having DBS in August of this year (2011) I can drive my own car again, sit and sew at my sewing machine again, ride my horse again, button my own buttons, garden, and I even plan on traveling out of state by myself by plane for the holidays. Dr. Nelson and his staff at BNA are nothing short of top notch in every sense of the word and come highly recommended by me. Dr. V, thank you very much for your help yesterday. You have been just great! The severe pain from my right leg and lower back was gone as soon as I began walking. Also many thanks for the picture and keeping my sister up to date while I was still at the surgery room. (The image you sent gave me an idea how much of the gel seeped out from the disc and how bad it was). Now I understand that the surgery was the only option for me. Again, thank you for the wonderful performance. An illness can be a traumatic experience and in some cases frightening as was certainly the case with my recent diagnosis. I appreciate Dr. Sharad Rajpal and his associates for their compassion, understanding, and counseling. I have felt that my treatment was thorough and has strengthened my confidence as I progress toward complete recovery. I particularly appreciate the assistance in preparing me for and getting me through my MRI exams which at first caused me great anxiety and apprehension, but now I can handle with relative ease. Thanks again to Dr. Sharad Rajpal for all his effort and concern. I want you to know my family was so worried and they told me you were there with them all through the bad time. It takes a wonderful and thoughtful Dr. to do this. I was so lucky to have (Dr. Rajpal) for my doctor and for the help you got for me. I am immensely pleased with Dr. Villavicencio. Now my lower back is entirely rebuilt with titanium and I have absolutely no pain. My lower back was in the process of coming apart, the top of my back separating from the lower part of my back. I had a couple injuries with I was 8 and 12, one involving a horse rearing up and over backwards and both of us rolling under a large dump truck, and the other with a horse rearing up and going over backwards over a four foot high embankment and down onto an asphalt street. I walked away from both accidents, and so did the horses. In the first accident one of my horse’s rear legs was pinned precisely between the double wheels on one side of the truck, and when the truck was driven off her she stood up and just had a three corner tear on her flank, which the vet sewed up. All I did was crawl out from under the truck. In the second accident the bit suddenly lodged in a rotten tooth, and the horse reared up and over backwards because he was in excruciating pain. Evidently I must have received some damage to my back in one or both of those accidents, and after walking around for another 50 or so years my back finally started to come undone. Villavicencio was recommended to me, very highly recommended to me, by my oncologist and by the surgeon who operated on me for breast cancer, and because they’re both very skillful doctors I trusted their judgment. We are extremely fortunate to have a brilliant neurosurgeon here in Boulder, and I was most fortunate to know good doctors who each, separately, said to go to Villavicencio. Arthritis has been the curse of my family…it is hereditary, and I have suffered from it since in my early 20s. When I got home from work, my wife would have to give me a back massage every night to get some relief. 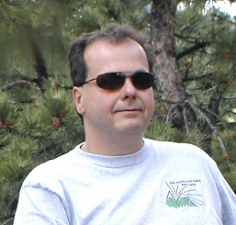 I had 3 spine surgeries for stenosis in Grand Junction in the 1990s. None of them gave me relief for very long. One surgery left me with a tear in the spinal sheath, which formed a sack of spinal fluid pressing on the nerve in my right leg. That left me with nerve damage and numbness in that leg. Later I had surgery at Swedish Hospital in Denver to repair that tear. It was only partially successful. It was not until I visited with Dr. V that I had hopes of more permanent relief from the pain in my back. In December of 2009, he performed surgery on my upper back, replacing 9 disks with synthetic disks. In June of 2010, Dr. V. fused several vertebrae in the lumbar. I now have almost no pain in my back. He also did further repair on the tear in the spinal sheath. Unfortunately, however, I still have arthritis in other joints. At my orthopedic surgeon’s recommendation, I plan to have a partial joint replacement in my right shoulder this fall. I highly recommend Dr. V. to anyone with back pain. He and his staff are highly professional, knowledgeable, and caring. I trust them completely. Just a quick note to thank you for doing a great job fixing my neck. I feel better every day and really appreciate you and your team. It is now 2 years after my L3, 4, 5 fusion. Prior to the fusion my performance in softball/baseball was limited. Although I am 78+ I am still playing baseball in a 48+ league and our 80s softball team took 1st place in Phoenix last October. In that “ring” tournament I hit 870 with a slugging % of over 1600! I was awarded MVP. I don’t even think about my back anymore. I was recently initially diagnosed with a pituitary tumor by my optometrist. She immediately sent me to Dr. Dan Hadley (my GP) at Dakota Ridge but recommended I see Dr. Nelson somewhere in the process. Dr. Dan Hadley ordered an MRI and sent me immediately to Dr. Nelson on his own opinion. Dr. Nelson diagnosed the tumor as a craniopharyngioma and started a whirlwind of effort to get me immediately to Baylor Medical Center in Houston. He along with his assistant (Toni) opened many doors and arranged schedules, tests, and doctors. Five days later we were in Houston and meeting with “the” world-class craniopharyngioma team in the US. When asked by them how I managed to get to them, I spoke of Dr. Nelson and his relationship from his days at BCM with Dr. Yoshor. During my visit with Dr. Yoshor, he praised Dr. Lee Nelson to his two resident doctors and the best the program delivers. Over and over again, I hear of his abilities here at BCM and how his efforts got me to them. He is a no nonsense surgeon, with high integrity. A straight shooter. He has even expressed a desire to fly down to Houston next week to participate in my surgery here at St. Luke’s Episcopal. This team as my vote. Thank you so much for your incredible surgical skills, your wonderful people skills and your kindness and humanity. We were so lucky to find you. Affectionate wishes to Karrie and the children. I was introduced to Dr. Rajpal on November 17, 2010 when I was hospitalized and he told me that I was going to need brain surgery. He explained to me about what I was going to need and that I was having surgery on the 19th of November. I wasn’t as particularly clear as I usually was but he had answered all of my family’s questions. They were certain that he was going to do a great job on me. 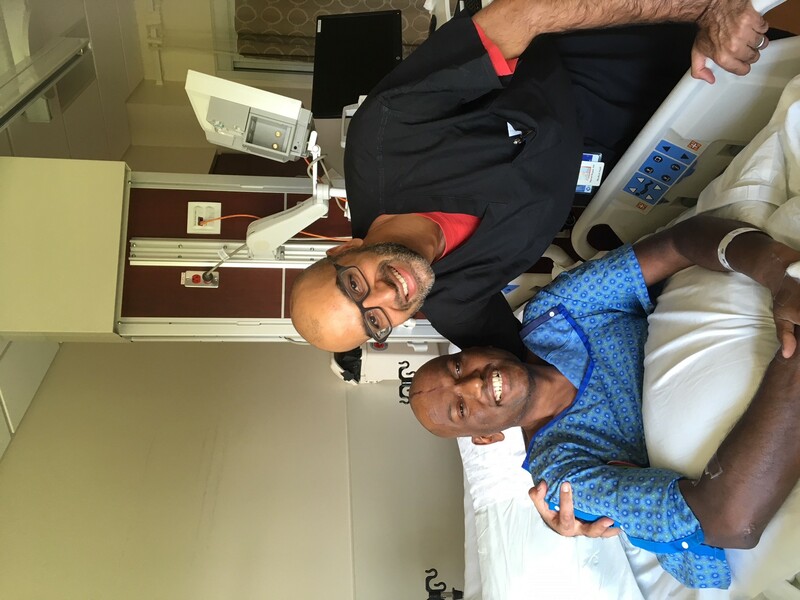 Dr. Rajpal did an excellent surgery on me and came to see me every day while in the hospital. My follow up care has been excellent and he is impressed with how well I am doing. I am very certain he has done an excellent job on me and has certainly gotten me back to feeling exactly how good I felt before I was surprised by the unexpected surgery. I feel great! If anyone I know should ever need a surgery like I had; I would very definitely recommend Dr. Rajpal to them. I know he is highly qualified to perform this type of surgery. Thank you for taking the time to educate me about your philosophy regarding spinal care. I learned a lot and you helped me re-set my expectations regarding many of the new laser treatments out there. I’ve done a lot of reading on the internet about back treatments but I’m not an expert so I can’t distinguish between procedures that give me the best opportunity for long-term back health and those that may cause greater problems. Thank you for your patience and helping me gain a more thorough understanding about long-term spinal care. Dr. Nelson worked a miracle: after months of pain I can now walk again, and without pain. He has all my respect and gratitude. I can’t say enough good things about my experience with BNA. Dr. V and Alex are amazing!! Within 2 hours after surgery my nerve pain was gone and within a few weeks after my back surgery I felt like a brand new person. Thanks so much. I will be glad to refer anyone to your practice! Dr. Villavicencio’s bedside manner is exceptionally pleasant. I feel he cares about me and it’s not just the process. His PAs follow suit. Eric Busch and Alex Ashton are excellent PAs and very easy to talk to. I trust Dr. V totally. Patients truly come first at BNA! My quality of life is much improved and continues to get better since my surgical procedure! I had excellent diagnosis and treatment from Dr. V; Alex + Eric. Not one minute of pain since surgery. Thank you for the opportunity to send this letter to express my thanks for the service I have received so far. I am sure that the rest of my care will continue to be excellent. I originally planned to write this letter in Microsoft Word, but then I realized a handwritten note would be the best way to show my appreciation. One of my main concerns was my handwriting. As a teacher I taught handwriting. Dr. Sharad Rajpal’s calm manner and ability to truly listen to my concerns put me at ease for the beginning. Having no idea what to expect and limited hospital experience in my 78 years of life, he provided the necessary information on the procedure so I did not become anxious or upset. Throughout my stay in the hospital, and the two weeks at home before my appointment, both Dr. Rajpal and Sam Lopez, PA-C quickly responded to my concerns which demonstrated their continued care. I am sure their support has added to my speedy recovery. I am gaining strength and feel sure I will be able to return to my part time job after Christmas. I also have a good feeling about Kai Stobbe from the two times I remember seeing him. Your office staff have been very helpful when I have called. Boulder, Colorado is fortunate to have such good health providers who cooperate with each other. I was amazed at Dr. Rajpal’s knowledge of my medical background, even to the point of having my nasal spray in case it was needed available in ICU. For one who had “hospital phobia” in the past, my experience at both Boulder Community Hospital facilities have helped alleviate that challenge. After my January appointment, I hope I will not need your services in the future. If I should, I’m glad you’re here. Considering the condition of my spine, if I should need further help, I know where I can get excellent care. Thank you again for this opportunity to express my appreciation. It was in 2004 that Dr. V. gave me my life back. After 30+ years of life long occasional but increasingly debilitating back pain, that particular lower back pain event would not let up after a week as it had in the past. After more than a month of unrelenting pain, Dr. V. met with me for 20 minutes on a late afternoon. He was respectful, kind, direct, professional, and talked person to person. He had already read my lower back spine images, and explained carefully to me that he wouldn’t do surgery if there were other alternatives first, but in my case, I really had no other option but to be in pain or have microdiscectomy surgery. Because I was in constant wincing pain and struggling to move and go to the bathroom, he offered to get me in before his first scheduled morning surgery the very next day. At 6am I hobbled into the surgery prep room with a cane and could not even sit on the gurney without assistance. By noon, I was able to stand up out of the recovery chair, walk out of the hospital unassisted and return home pain free. I did not see Dr. V. after the surgery, but he did call me at home to check on me. I did a follow up with his assistant and had no need to see Dr. V. again. However, I remain forever grateful, as I have not had even one bout of back pain since the surgery. Today I am able to reach down and pick up objects off the floor without a second thought or hints of pain symptoms. 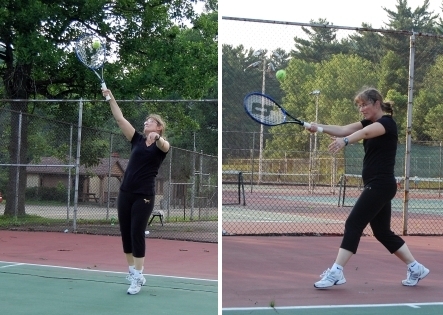 I am more active and athletic now at age 58, than I ever was when I was younger in my life. Yes I would recommend Dr. Villavicencio to anyone in a heartbeat. I believe him to be one of the best neurosurgeons available in Colorado. Just wanted to let you know my recovery has been progressing nicely. I have resumed doing some lite yoga classes along with a couple of great mountain bike trips. Thanks for bolting, clamping, screwing, and stitching my spine back together. My leg strength has been getting better all the time. My thanks to you and all of your team members for all of your expertise. Here are a couple of pictures, one from Slickrock in Moab Utah, and the other from 11,000 feet up in Crested Butte, top of the 401 trail. Dr. V is the best spinal surgeon in the world. I lived in Colorado in 2004 when he performed my first surgery. I moved to San Francisco in 2009 but came back to Colorado for Dr. V to do my second surgery due the excellent results I had with my first surgery. And being 80 lbs lighter I am recovering much faster than last time. Dr. V’s surgery skills are phenomenal. I can’t thank him enough. I wanted to thank you for your extraordinary efforts on Vince’s behalf – and for your understanding and patience with me! I just wanted to take a moment to thank you for helping me to the road to recovery. On Aug 23, 2010 you performed a microdiscectomy on my L5/S1 herniated disc. I had been suffering with the pain for 8 months and unable to sit, and everyday was painful. I had about had it so I wanted you to perform surgery. I am so pleased with the treatment I’ve received from both Dr. V and Eric; and the personal phone call from Dr. V at home after being discharged from the hospital. I would definitely recommend them at any time. Just a few words about my experience with Dr. Villavicencio and the staff at BNA. I could not be more pleased with both the performance of such a skilled surgeon and his caring toward the well being of his patients. My neck surgery was successful and the follow up and visits to BNA were up to any expectations I could possibly have from a doctors office. Dr. V and his staff were good listeners and easy to talk to and I always had a clear picture and explanations as to my problem areas and help with how to solve those problems. I would change nothing about my experience with this office and the personnel. I was unable to walk due to injuries to my cervical discs and spinal cord after a car accident. Dr. V performed a complicated ACDF procedure and I am now walking and playing no check senior ice hockey because of his expert knowledge and surgical skills. He and his staff have been absolutely terrific during my recovery and rehabilitation. I am extremely grateful to everyone at Boulder Neurosurgical & Spine Associates. Just wanted you to know that since Thanksgiving this year, I’ve been working at Target, late shift (5pm to midnight) on my feet, standing except for 2, 15-minute breaks and 1, 30-minute lunch break, walking miles and miles each day, without any back pain. Truthfully, I never thought I’d be able to do it but I did it – no cane, no walker, with my shoes built up on the left foot from Perry’s. Thank you for bringing a nearly pain-free existence back into my life after so many years. The scoliosis is still there but I’m still walking for exercise and putting all the pieces together, it seems to work. Thanks to you and your staff plus Alex. Also, since the May radiation for the brain tumor, I have not had 1 migraine – another miracle! I am a 74 year old Caucasian male and a retired aerospace systems engineer. I consider myself a little better educated than the norm, with an undergraduate degree in astronomy and advanced degrees in business management and biometry. Over the years I have enjoyed relatively good health and taken fairly good care of my body, working out and trying to watch my diet. All my efforts seemed to be for naught! Four years ago, I developed sharp pains in the back of my right thigh when rising from a sitting position. Eventually, similar pains appeared in my left thigh. The pain level during these episodes was about 9 and I could not move until the pain started to subside. After about two years of misdiagnoses, an MRI was taken of my lumbar spine which showed that my pains were the result of spinal stenosis. Your story to this point may be similar. My doctor told me that there is no real treatment for this ailment other than surgery. I accepted his referral to Dr V in July 2009. Dr V’s approach was conservative, referring me to a pain specialist and to physical therapy to try to deal with the pain episodes. The epidural shots relieved the pain and made my life bearable. The effects of the first shot lasted about six months, of the second shot about four months, and the third shot about three months. The fourth shot was next to worthless. At this point, Dr V recommended micro-decompression of my lumbar spine to relive the pressure on the spinal cord. 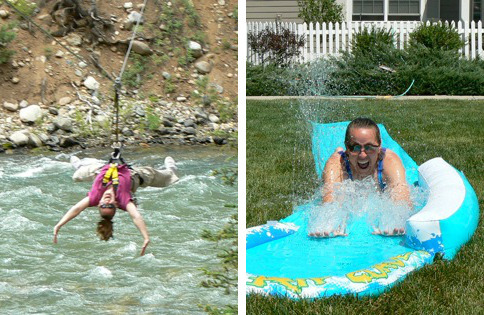 I agreed to this and was admitted to Boulder Community Hospital (BCH) early on 15 July 2010. I was operated on at about 9AM and was walking around the ward pain free by 3PM. 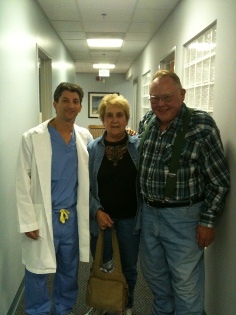 Dr V and Eric Busch personally visited me as they monitored my progress. I was discharged from BCH at about 8PM and my wife drove me home. To put it mildly, I was very pleased with the outcome of the procedure. Follow-up visits with Dr V and staff monitored my progress and at my six month checkup I was released from their care. I continue to be absolutely pain free. I have one small scar on my lower back and have suffered no ill effects from the surgery. I am back lifting weights and am as active as I want to be. If you are suffering from spinal stenosis, I strongly recommend Dr V and the BNA staff and their approach to treating the pain from this illness. Thank you for saving the life of my precious daughter, Penni Pearson Beuf. My husband and I are the most fortunate people in the world to have been operated on by Boulder neurosurgeons Alan Villavicencio and Lee Nelson. February 19, 2010 I was diagnosed with a glioblastoma. Dr. “V” was booked until April, be he found a place in his heart to perform a craniotomy on me the very next day, which was a Saturday! He’s so skilled, modest and brilliant that he extracted the GBM from my right temporal lobe. My MRIs just keep getting better. Not only did he get the entire tumor, but he got me into the Duke brain tumor vaccine study, which was the ideal follow-up procedure. He graduate first in his Harvard Medical School class and studied under Dr. John Sampson at Duke. Sampson is the head of the vaccine study and brilliant as well. As luck would have it, 6 months to the day my husband had a bike accident, which resulted in a brain bleed (subdural hematoma). Dr. Nelson also operated on him the very next day. He too is a brilliant expert at neurosurgery. We both were in the best of hands. Boulder Neurosurgical & Spine Associates and their whole staff are the best of the best. P.S. Chek is doing so well that he walked 3 miles 2 days in a row – less than a week after his craniotomy. You’ve had a positive impact on every facet of my life. When other people have asked me about my experience with you, the surgery is only part of the answer. All of the people I dealt with – Alex, Teresa, Dori, Eric and everyone else – were wonderful. They were a terrific help to me in managing a process that I knew very little about just a few weeks before, and their professionalism and friendliness were a huge help to me both before and after the operation. The nursing staff at MISI were all super, and I’m especially grateful for the institutional flexibility with respect to keeping me there for the extra night after surgery. In short, it’s difficult to express just how grateful I am to you. I was walking with my uncle the week after the surgery, and he commented that if he hadn’t seen me beforehand, he wouldn’t have guessed that I had ever had a back issue. He was obviously stretching a point: I know that I’ve got a few months more of careful rehab before I’ll get back to ‘normal’, but to be where I am – compared to where I was – feels like I was the beneficiary of a miracle. My seven year old son was so happy to see me walking (as opposed to dragging one foot) that he burst into tears – he said it was the best Christmas present he could have had. I can sit down to dinner with him for long enough that he can have ice-cream… for the past few months, I couldn’t sit down for long enough for us to finish a glass of water together, never mind dessert. As I said before, the changes you’ve brought about in my life are simply enormous. I’m more grateful than a letter can adequately express, but I hope this goes some way towards conveying my gratitude to you and your team. I’ve recommended your practice to the first person who asked me about my experience at BNA, and I’ll recommend it to everyone else who asks me in the future. I’m so grateful to you and your staff for the quality of your surgery and the wonderful service on either side of it, and my family has gotten back a person that they’d basically lost for much of the time preceding the operation. Again, I really can’t thank you enough, but I hope that this note goes some of the way towards expressing my gratitude to you and all of your colleagues for the massive change that you’ve wrought in my life. Thanks, Dr. Nelson, for your neurosurgical expertise and one-in-a-million, amazing personal care. I hope you will remember me as one of your most grateful success stories. My family(-ies), friends and coworkers are truly impressed with the immediate relief I received after the outpatient/same day procedure. Being in severe pain for over 3 years with lower back lumbar problems and not being able to function in daily activities, and seeing several doctors, I was finally recommended to Dr. Villavicencio. My surgery was April 7, 2009. The last words I remember were, we can’t make you younger, but they did! I’m PAIN FREE!! 3 months later and living a normal life. I was one of the many people who had pain for about 2 years, got an MRI when the pain got more frequent and worse, saw a physician when I couldn’t run anymore because of pain. Dr. Nelson was amazingly detailed on the diagnostic end and very clear on treatment. I don’t say that lightly because I am also a family doc and a little picky about who I go to personally. I was walking around 4 hours post op and realized within 3 minutes “that pain was gone”. Anybody with back issues will know what I mean. I am now 3 weeks post surgery, walked 4 miles outside on a snow packed trail with 40″ slow jogs – no pain. Never mind Dr. Nelson said don’t run till 4 weeks. He doesn’t know everything. But he is a really decent person. Oh, and I am 67 years old. I was most fortunate to have been referred to Dr. Villavicencio in 2006. At that time, I was experiencing chronic pain, numbness, and lack of mobility in my right arm. Dr. V performed two surgeries: July 20 and July 24, 2006, a discectomy and cervical spinal fusion. Following a two-month recovery and physical therapy, my improvement was incredible! In 2008, once again I turned to Dr. Villavicencio due to severe pain in my right leg and eventually lower back pain. I ignored my situation until it was intolerable. I was frightened to undergo another surgery, but made the decision to go for it on November 6, 2008. I had (have) a complete trust in the skill and expertise of Dr. V.
I now feel years younger and have a “new lease on life”. My thanks also go out to Eric Busch, Alex Ashton, Alexis, and the staff at Boulder Neurosurgical & Spine Associates. You are simply the best!!! Knowing you need back surgery is frightening enough without the additional responsibility of finding the best surgeon. At the suggestion of my primary physician, I made an appointment with Dr. Lee Nelson. I was immediately impressed with his genuine concern for my situation and his willingness to take as much time as needed to discuss options, expectations and recovery. I continue to respect his professionalism after my surgery in how he, his PA and his staff are committed to my healing. Dr. Nelson is a rare find in today’s health care system. I want to tell you that although I am back in San Diego, you and your staff are always with me, in my mind and in my heart. I live in gratitude for all that you did to save my daughter and my life. My daughter had an amazing second chance because of you and all the other physicians involved in her care. There are no words to express how I feel and no way to ever thank you enough. After being diagnosed with a form of spinal stenosis, I knew I wanted both state-of-the-art medical care and a concerned and communicative medical team. I found both at Boulder Neurosurgical & Spine Associates. I initially chose Boulder Neurosurgical & Spine Associates because they have an excellent reputation with former patients and members of the medical community. A physician-friend referred me to one of their staff neurosurgeons, Lee Nelson, MD. 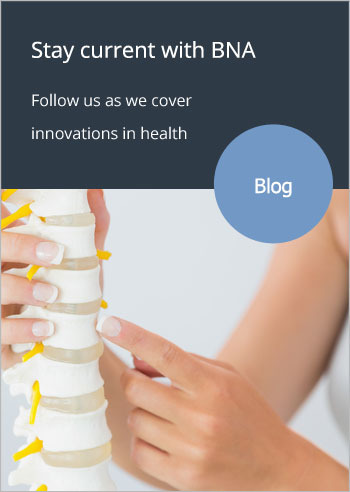 Anyone facing painful spinal problems experiences some degree of anxiety and vulnerability and needs guidance to understand their specific medical problems and the complexity of treatment alternatives. For two months, Dr. Nelson helped me with this process. He was accessible and responsive each step of the way, very willing to share his thoughts and ideas. Even the support staff was caring and efficient in handling requests and making medical arrangements. After trying a couple of conservative treatment options, I decided to have surgery. For me, it was a good decision and my pain is gone. I am very excited about resuming my active lifestyle. I am grateful to Boulder Neurosurgical & Spine Associates for their expertise and assistance and would recommend them and my neurosurgeon, Lee Nelson, without hesitation. Please also click this link to watch patient testimonial. 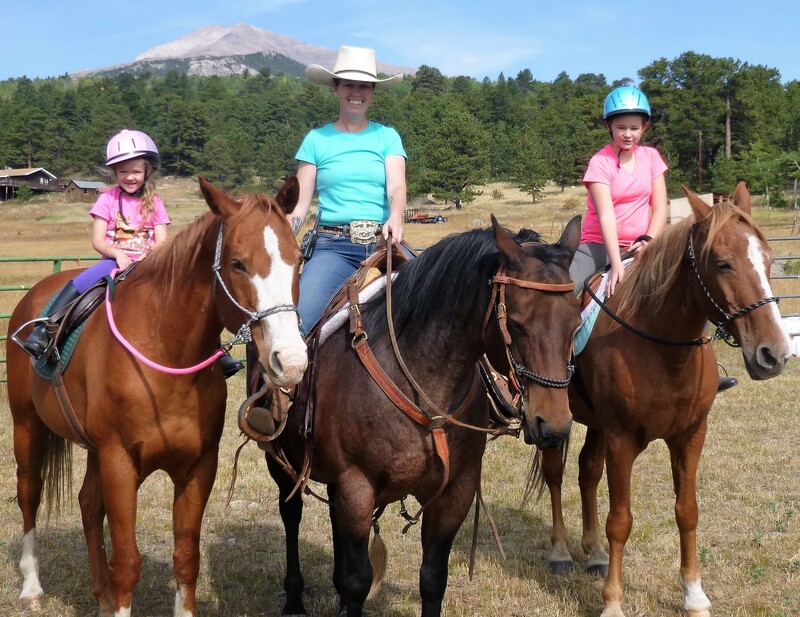 Long ago, I, my horse and a cliff had a rendezvous over by Steamboat, Colorado. That was the first severe injury to my lower back, though I had treated that part and the rest of my body with less than caution until then. I kept riding bulls (me and Advil), extreme skiing, wrestling, and horseback riding. My back got progressively worse, and I refused to see a doctor. Perhaps it was a trust issue, perhaps denial, and maybe I knew that science was not quite where it needed to be to get the repair work done with the result I would insist on from a surgery. I grinned (not always) and put up with the deterioration over the years, refusing to limit my activities. Then, in December 2006, my back said “enough!” and an additional injury resulted in me dragging my left leg around, and enough pain to make my eyes cross. An MRI revealed a blown disc and advanced severe stenosis. Four levels needed work, or, as my DO said without sugar coating, the result would be a wheelchair and diapers. I began researching doctors and procedures. I quickly ruled out just an orthopedic or just a neurosurgeon. There are very few surgeons practicing and licensed in both. I interviewed 11 of those and was not overly impressed. They were unsure and never asked me what I considered to be the key question. Then I met and interviewed Dr. Alan Villavicencio of Boulder Neurosurgical & Spine Associates. I was taken by his high energy, no-nonsense approach, dedication to a minimally invasive endoscopic procedure, and his can-do positive attitude, not to mention his very impressive curriculum vitae. Most importantly, he asked me the key question the others had not….”what are your goals after this surgery?”. To which I answered, of course, “to do everything I do now, but with a modicum of caution and common sense.” My first surgery was in February 2007. Three-plus hours on the table and I walked (shuffled) out four hours later. 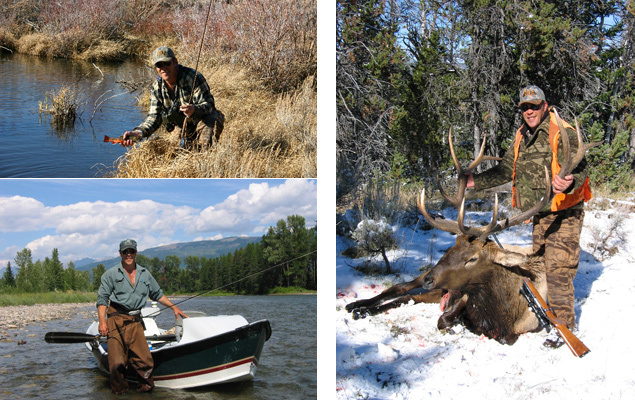 My recovery was terrific, and within six months I was doing all I had done before, including rowing drift boats, weight lifting, skiing, fly fishing and hunting. Then, in May of 2008, I foolishly did not wait for help and cleaned out two miles of an irrigation ditch on one of my ranches. Again, I had a motor impairment and severe pain in my left leg. The MRI revealed that Dr. V’s first surgery had held up 100 percent…but my obstinate stupidity (I believe the doctor refers to it as obsessive-compulsive) had blown out the disc above the first area of the procedure. His staff was terrific in quickly lining up interim epidurals, MRI and blood tests. Dr. V got me right in, performed a flawless second repair to the newly damaged site, and here I am four-plus months later, still having a ways to go, but having already gone elk hunting, fishing, rowed (gingerly) a drift boat, and sharpening my skis for the upcoming season. And this time, trying to be smart about it all. Thanks, Doc V, you are a wizard! 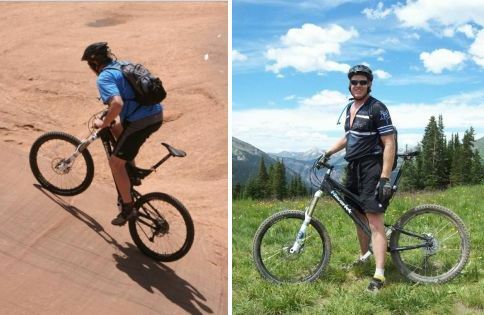 After living with worsening lumbar stenosis symptoms for three years, I made a nervous decision to have laminotomy surgery with Dr. Lee Nelson at Boulder Neurosurgical Associates. My nervousness was unnecessary! I am now pain-free and play golf again. Dr. Nelson brought to my situation the unique expertise needed to resolve my problem, the commitment to apply the most advanced and least invasive approach to my surgery, and the compassion to communicate effectively with me throughout. I couldn’t be more pleased with the results. I am 34 years old and Dr. V performed a dual microdiscectomy on my lower lumbar back in December of 2004. I had never been in such pain in my entire life. I could not live a normal life, because all I ever thought about was the pain. My right leg and back had shooting pains and I could barely walk much less work. I had some back problems since I was 17 years old on and off. Once the pain became unbearable I was forced to have surgery because it was my only option. I had been opposed to it in the past. After the surgery, I was skiing fresh powder four weeks from the day of the procedure. I now ski, mountain bike, and play golf better than I did in my mid-20s. After the surgery, I was able to get into the best physical shape of my life and I was finally able to focus on something other than the pain. I have become a totally different person in my day-to-day life and I have become a successful businessman. All I can say is thanks Dr. V! I met Dr. Nelson on a Tuesday. I remember the day clearly because I was in a wheelchair, and in agony due to low back pain and burning ice-fire in my legs and feet. My other physician didn’t know what was wrong with me and suggested pain medication and patience. Meanwhile, I was unable to work, cook, clean, or shop. As time passed, I was unable to shower, walk, stand, sit, or lay down without extreme pain. I’d been struggling mightily for four months. On the Tuesday I met Dr. Nelson, he listened to my story, performed an examination, and said words I’ll never forget: “How about we admit you and do surgery tomorrow?” He also patted my knee and said, “We care about you and we’ll take care of you.” I wept with relief. He immediately intuited that the lumbar disc was bulging terribly. He immediately knew I needed help, N-O-W. The next day I had a double lumbar laminectomy. When I woke, I was utterly, blessedly pain-free. It’s been one month since surgery, and I’m back to work, back to life, already walking a mile and a half each day, and feeling terrific. 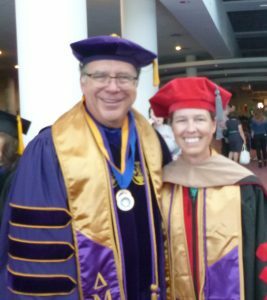 I’ll never forget Dr. Nelson’s compassion and expertise! After basically collapsing at my office one day in excruciating pain, I learned, through a subsequent MRI, that I apparently had herniated a disk in my lower back some time before. Dr. V. and his team managed to control my immediate pain with medication, but neither the medication, nor a later cortisone shot, relieved the pressure that the herniated disk was placing on a nerve in my back. This pressure caused me pain in my leg and foot, as well as numbness, sensitivity to touch, and weakness in my foot, which affected my walking and other physical activities. After consulting with Dr. V and his staff, I opted to have the damaged pieces of my disc surgically removed. In the last several months since my surgery, the numbness and sensitivity has almost completely disappeared, and I have gained back virtually all the strength and functionality I had lost in my foot. I am happy and relieved to have made the decisions I did – both to have the surgery and to have picked the right team to do it. I couldn’t be more pleased with the treatment I have received from Boulder Neurological Associates, from my first initial consultations, to my final postoperative assessments. Dr. V and his team offer the highest caliber expertise and the best professionalism I have encountered. I would absolutely recommend them without reservation to anyone who needs their services. Sorry, this has taken so long but, I have been running around the country with my family. Obviously, none of this would have been possible without your help. When I came to you last summer, I was in constant pain. I could not walk, stand, sit or sleep comfortably, or for very long. I was scared of another surgery and the long recovery. I am so grateful that you were able to get me in quickly and operate so smoothly and successfully. From the moment I woke up I felt better. I walked the night of the surgery and used very little pain medication. The hospital stay was remarkably different this time, as has been the entire recovery. I was able to walk earlier and more comfortably. I have continued walking twice daily and have increased the time and distance. I am now able to join my family traveling without worrying that I will slow them down or have to miss out on the fun. I am four months from surgery and am mostly pain-free. I still have occasional nerve pain, mainly when I stretch too much or bend too much. If I behave myself, I have no pain. I am in physical therapy and getting stronger every week. I am confident in a full recovery. I wanted to write to you personally and thank you for helping me with the stenosis I had in my low back. I started back to work today and although I am moving a bit slower with mild discomfort, I am grateful for the work you have done. The symptoms, I had in my legs and feet are virtually gone and even the “creepy” feeling I was getting is also gone. In fact, my entire experience with your group was extraordinary! I would like to mention a few folks worth noting starting with Alex Ashton. Alex was remarkable in his detailing my options, as well as answering any questions. His personality and friendly nature were very reassuring. Cathy Polzin was also terrific. She was right there with a smile on her face and handled all my questions in a remarkable and professional manner, even when a last minute move changed the procedure from Longmont to Lafayette, and dealing with my follow-up visit, she handled it all. I want also to mention Shirley at the Minimally Invasive Spine Institute. I can’t say enough about her pre-op and post-op care. I was grateful she was assigned to me for the day. Top to bottom, you have a remarkable team of professionals and my expectations regarding this process and procedure have been exceeded! Lastly, thanks to you and your skilled approach in dealing with my back problem, as I have had great results thus far. I broke my neck during a hockey game when an opposing player broke the rules and checked me when I didn’t see him coming. I have never experienced fear and panic the way I did during the following four days as an inpatient. I was very uneasy around the medical staff during my initial treatment and had tremendous fear about my ensuing surgery and what it would mean for the rest of my life. There are two fundamentally different ways to do C5-C6 fusion surgery – through the front of my neck or through the back. I have since learned that there are several advantages to the modern approach, which is through the front. Dr. Villavicencio executed this surgery perfectly. 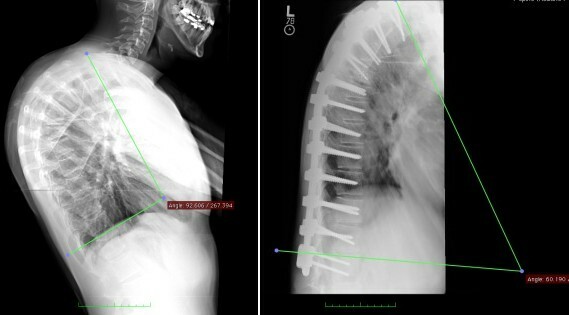 The precision of the bracket and screws in my neck are a marvel to look at in my x-rays. My surgery was almost a year ago. I play hockey twice a week now (I only played once a week before the accident). No price could ever be assigned to being able to live my life the way I did before and to have the confidence to still compete in a sport like hockey. I play with a measure of caution I didn’t before. And this might sound ridiculous, but it has even occurred to me that I should continue to play in the Boulder area, so that in the event something like this ever happened to me again, there would be a chance that Dr. Villavicencio would be in the ER. I often think about how all of the years of hard study and stressful practice that Dr. Villavicencio has gone through have made him able to restore the quality of my life. I couldn’t be more appreciative. I was experiencing relentless headaches, pain between my shoulder blades, staggering, dropping things, tingling and numbness in my hands and arms. I saw my primary physician and was advised to consult a neurologist, then three other specialists, each of whom was unable to explain or correct the problems. When I was sent to Dr. Nelson, he immediately ordered an MRI of my cervical spine based on his understanding of my symptoms. The MRI showed the disc between C5 and C6 was pressing on my spine. He ordered a surgical procedure the next day to relieve the problem. Dr. Nelson’s expertise and superior skills as a surgeon relieved all the symptoms I was experiencing. He is incredibly intelligent, with an impressive knowledge base and an awesome work ethic. This was fantastic! However, the most wonderful aspect of his care is his sympathy and empathy for his patients. Dr. Nelson cares about YOU. You are not just another case to be completed and forgotten. He is kind, thoughtful, gentle, and practices with great TLC. His calmness calms you; his smile warms your heart and soul. His patients are truly blessed. The best of the best is all one needs to know. My first encounter with Dr. V was when I was brought in by helicopter in a “flight for life.” Yes, I’m sure he dropped whatever he was doing to speak with the doctors in Wyoming and agree to be available to perform the unscheduled emergency surgery that would prevent me being paralyzed from a broken neck. I’m sorry if it inconvenienced those that might have had scheduled appointments, but I and my family will be eternally grateful. The next few days Dr. V did follow-up in the hospital and was amazing. When I was concerned about insurance coverage (Dr V wasn’t on my “plan”), he advised me not to worry that he wasn’t worried about collecting money. He advised me if insurance was a problem, he’d do it for free. He was concerned about me, not money. He was called away on an emergency once when he was in my hospital room. My wife, having asked questions that he did answer, still had a question he didn’t have time to answer. He took the time to apologize as he was leaving and explained quickly that it was an emergency. We’d heard the call – it was. On my follow-up visits, I saw his assistant, a fantastic PA who was caring and responsive. I did have occasion to have a later surgery unrelated to my car accident and I received the same excellent care. I will say Dr. V does not handhold. I did my own research to educate myself before going in, so that I didn’t ask rudimentary questions, because I do know his time is truly precious, he is focused on helping people, and he is a limited resource. My back surgery was amazing. Again, well done, completely professional. Due to a degenerative bone condition (which I may point out was completely missed by the “specialists” at University Hospital resulting in years of unnecessary pain and further degeneration that could have been prevented had I been properly diagnosed, and which Dr. V recognized immediately), I may be facing another surgery. I met with his PA last week, followed by a short consultation with Dr. V. Dr V. can immediately see what others miss in their 20-minute consultations. I don’t like surgery but, I will say that he is the only doctor I completely trust to handle my back surgery. You can take all of the CVs of the neurosurgeons at the University of Colorado Health Science Center, put them together, and they would pale in contrast to Dr. V’s. The basic question is, “If you have a surgeon deep in your brain or close to your spinal cord, what is of the most value… one of the best technical surgeons in the United States with total focus and incomprehensible talent, and a genuine care for patients or, a neurosurgeon who spends hours calming his patients to make them feel better?” Your choice. Just wanted to touch base with you by email. You did an L4-L5 fusion on me January 18, 2007. I had broken L4 some 30 years prior, and before the surgery, it had really worn out. I put this operation off for many, many years but it had finally got so bad in December 2006 I decided to have the surgery. This week I had a follow-up x-ray and the report is that it looks great. I was thinking last summer how it was weird not to have any back pain, since it had been with me most of my life. Still, no pain. I can do anything now. I can’t thank you enough for what you did. You have truly changed my life in ways I thought would never be possible. I could be philosophic about this, but I just wanted you to know how much you have changed my life for the better. Eternally in your debt!!! Prior to my surgery, it was difficult for me to walk because of the pain I experienced in my legs. I was apprehensive of the surgery because I had never had a “major” surgery before. After my surgery by Dr V, I have had no more pain in my legs and am enjoying walking from four to six miles every day now! Thank you so much, Dr. V! Eighteen months ago, Dr. Villavicencio surgically corrected my degenerated disc condition. Since then, I am completely pain free and can enjoy all normal activities. He and Physician Assistant, Alex Ashton, explained the options, procedure and anticipated the outcome in a way that I felt included in the decision-making process. An added plus is the very professional office staff. All my appointments have been on time and follow-up calls have been quickly made. It seems everyone values the patients’ time. I could not be more pleased with Boulder Neurosurgical & Spine Associates. When I think about my experience of having serious back surgery at Boulder Community Hospital, there are many words that come to my mind to describe the absolutely professional care I received from you. Some of those words are competent, compassion, humbleness, and the way you so carefully explained what would be necessary to correct the problem. I so appreciated the way you prepared me for the recovery period. It is so wonderful to be free of pain after several years and I would recommend your services to anyone. Thank you for my new lease on life! My name is Bobby, I’m 19 years old. I have scoliosis. It was getting really bad. My neck and shoulders were getting curved. My back and arms always hurt. Before surgery I was only about 4’8” tall and now I’m about 5’3” tall. My mom is really short, so now she calls me her giant man. The surgery itself went really well and my back healed really fast. There’s only one line down the middle of my back, there was very little swelling and bruising. They said recovery would take at least 1 year, but it only took about half the time to heal ☺. My Drs. were really nice and helpful. They answered all my questions and took time to listen to me. I just wanted to thank you for the GREAT surgery on my back. 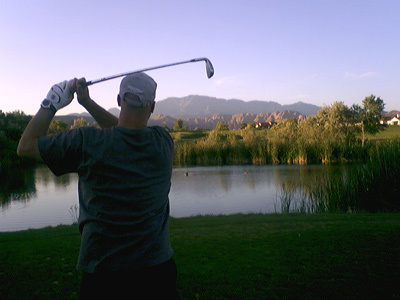 Everything seems to be going very well; no sciatica or other pain and have been playing golf for a month now. I have given your name to friends who have asked and it seems you will see my brother Charles early in the New Year to fix his back problems. Thanks again. Dr. V saved our son’s life with a very difficult and rarely done procedure. He had the confidence and the skill to do this procedure, which others had declined. He explained to us what he needed to do and afterward spent the necessary time to explain how it went and showed us the MRI and CT scans of before and after. He took all the time we needed to answer questions. We cannot understand those people who are complaining about his bedside manner. True, he is not a hand-holder, but considering that an extra 15 minutes with each of his patients would mean fewer patients getting the benefit of his skill, we would rather have him in the operating room than wringing hands with us. We also need to compliment the surgical team he has working with him and the staff at Boulder Community Hospital. They are all first rate. I had severe deformity in my spine and it actually was crippling me so I couldn’t walk without pain and at times fell because my legs failed. My spine was curving in an S, so I was hunching over. Now – no pain, recovering strength and mobility. Doing very well, no back pain at all in the area of disc. I have occasional mild pain at the right sciatic notch, particularly when sitting too long. Nerve pain in legs is mostly gone… occasional discomfort, again when sitting too long in some chairs (or car seats). Twitch in left toes has stopped. 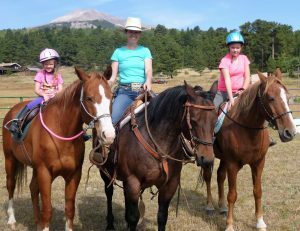 I am able to do all activities with no discomfort at all (currently yoga, elliptical trainer, Nordic skiing, horseback riding, walking). Just wanted to take a quick minute of your time. I just wanted to thank you for the surgery performed on Oct. 12th on me at MISI. I am feeling better than I thought possible in a short amount of time. For that I thank You. After suffering from 10 years of chronic neck pain and headaches, it feels absolutely amazing to be able to be physically active once again…it’s like a whole new lease on life for me, which I’m truly grateful for! It’s a horrible feeling to be kept captive by chronic pain. So, I extend once again, my sincere gratitude to you, and your surgical team for your wonderful care given to me, and I give thanks to God for your gifted hands as a surgeon. I’m extremely pleased to say that my neck is doing great, and that I’ve not had any headaches (in relation to my neck), since my cervical surgery! This past week, after nearly a year, Gary, my husband, was released from the care and Dr. Nelson and his staff at Boulder Neurosurgical. I’m so thankful I was referred to you – I had been in tremendous pain from a disc herniation for over 2 months when we met. I was ready for straight answers and a solution to getting my life back…I can’t THANK YOU enough for giving it back to me! You and your staff treated me with great respect and I knew I was in great hands. It’s pretty scary when you start losing the physical ability to live your life. I was literally pain free right out of recovery! I’m doing great since my microdiscectomy! I’m backpacking, hiking, biking in just 6 months post surgery. You were awesome – explaining my options and reviewing my MRI with me, as it was a severe herniation… I was nervous but understood time was of the essence. I really appreciate your dedication to excellence and enthusiasm for quality of life – you get it big time! I tell everyone about you and your team. I’ve sent you 3 referrals and can’t be more appreciative of your commitment to excellence! Whenever I hear of someone in back pain – you’re the one I’m insisting they see, along with Cranny! I can’t be more appreciative of the care I received – you’re the best! Cranny is taking me to a new level as well. Keep on racing – good luck with your sports training facility! I have no more back pain or leg pain after my surgery. Thanks Dr. V.